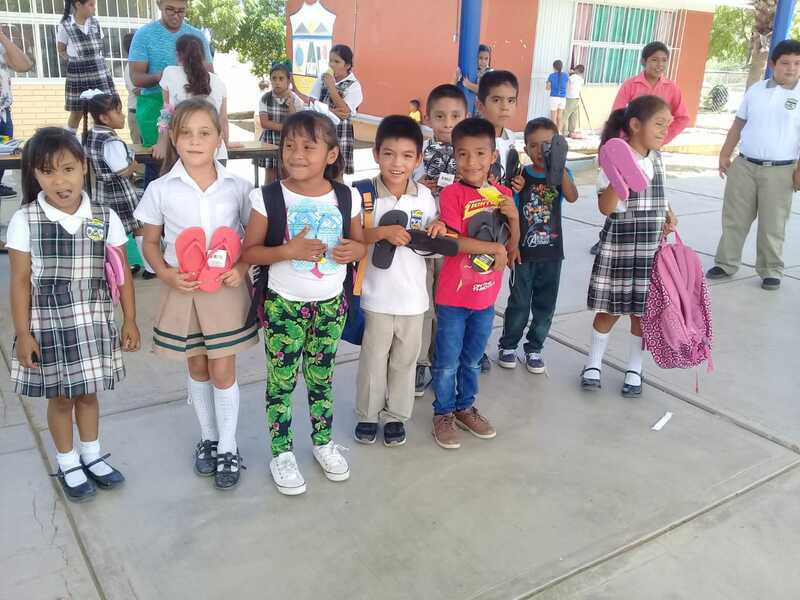 Weather – It was getting pretty crummy and snotty even before the storm hit us late Tuesday when it started raining and didn’t stop until late Wednesday. So it wasn’t real great at the beginning of the week weather-wise although the fish bit right up to the wind, waves and rain started crashing on our heads. It wasn’t a hurricane, but it rained or drizzled or misted for over 24 hours. 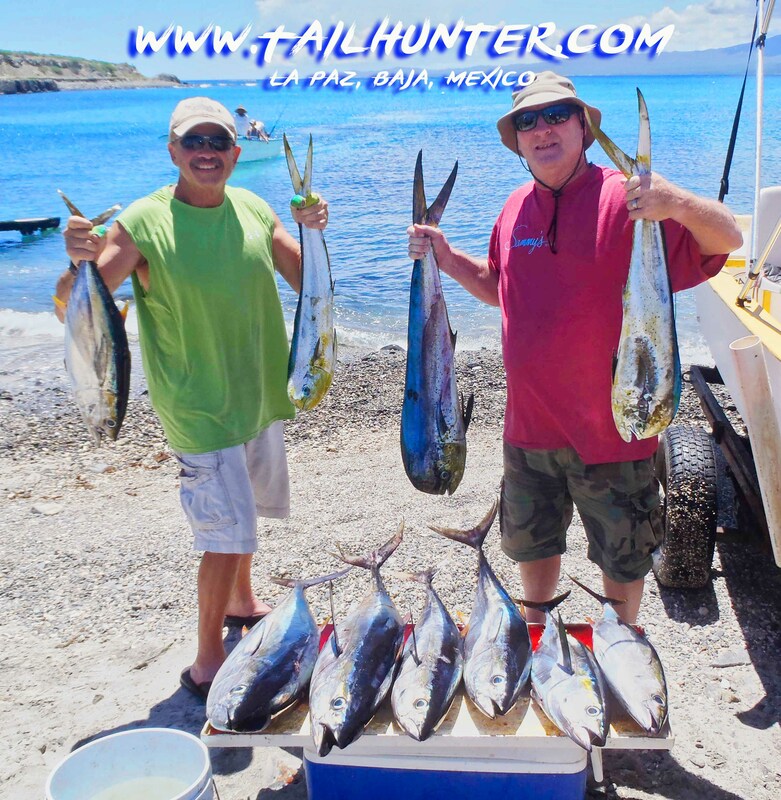 The Port Captain closed down all boat traffic on Wednesday so we couldn’t fish at all. 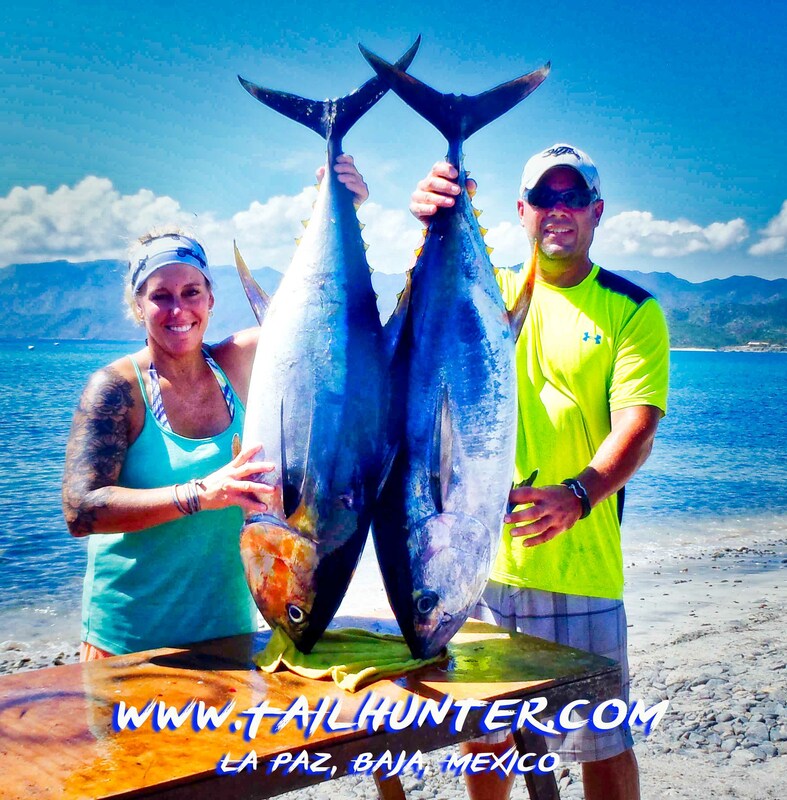 FISHING – Tuna still center-stage from footballs up to 100 pounders. They bit right up to the storm. After the storm, they took about a day or two to get up to speed again, but then it picked up again. 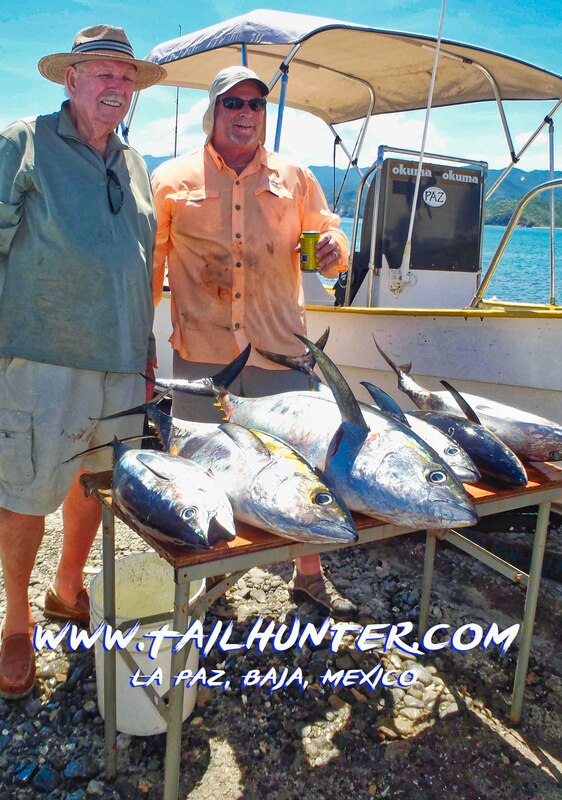 Biggest surprise was all the tuna that showed up just outside of La Paz Bay where the fish foamed. 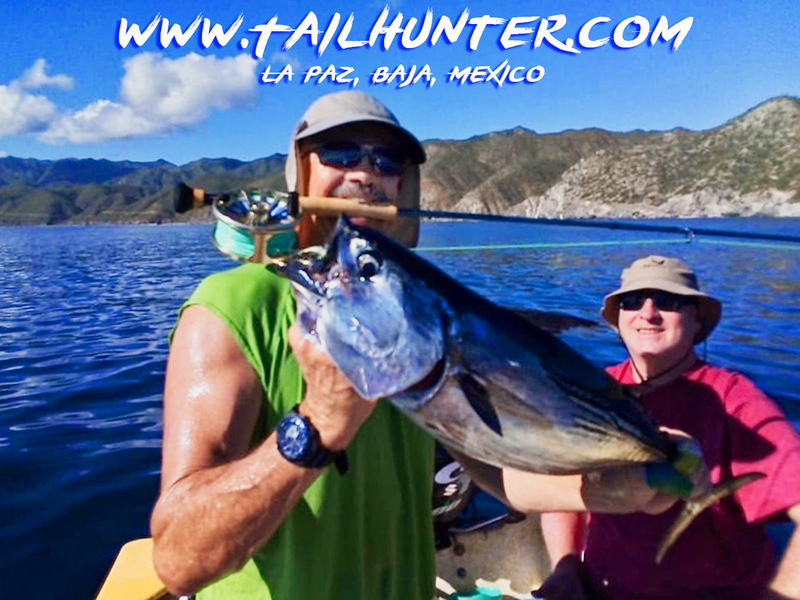 So, we had tuna hitting at both Las Arenas/ Muertos as well as La Paz! CATCHING – Everyone who wanted fish to bring home had fish. 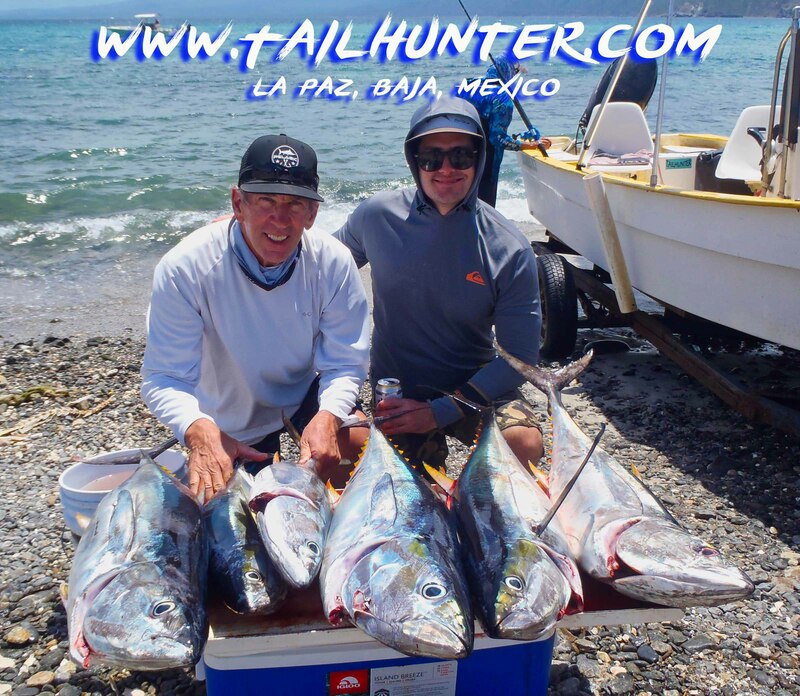 But most of the larger tuna busted off…and busted up some of our anglers who ended up with sore backs, shoulders and arms! 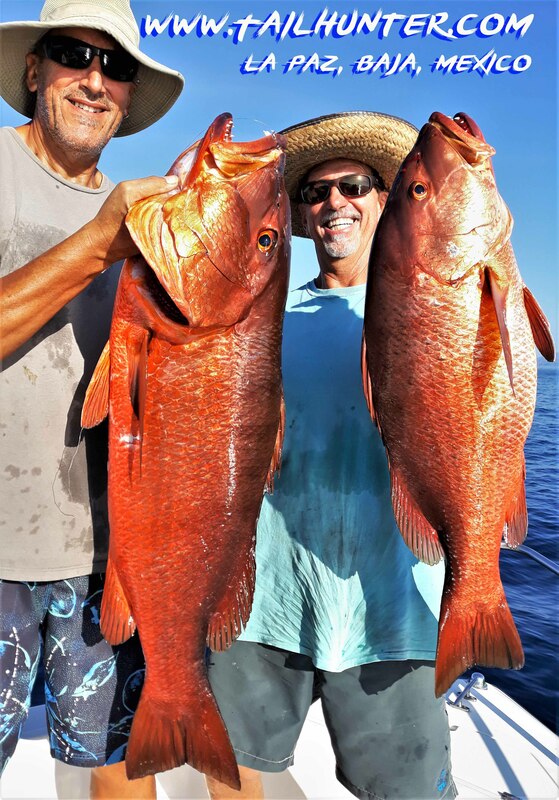 With Captain Jorge, Dave, Tony and dad, Felix Basadre from Long Beach pulled this hefty dog-tooth snapper out’ve the rocks! Great catch! 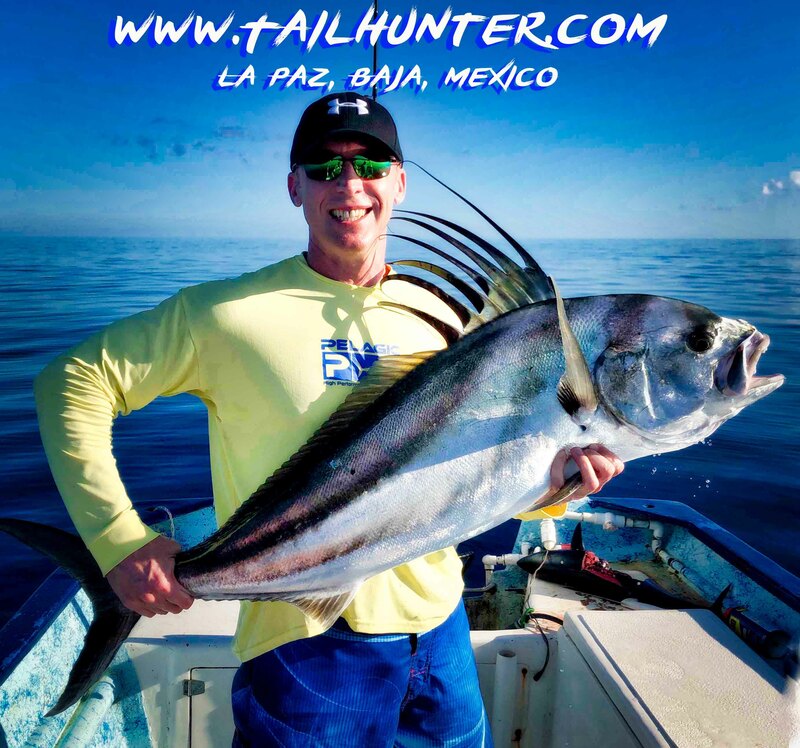 Chris Hutto…yes, you made the fishing report, Bro! 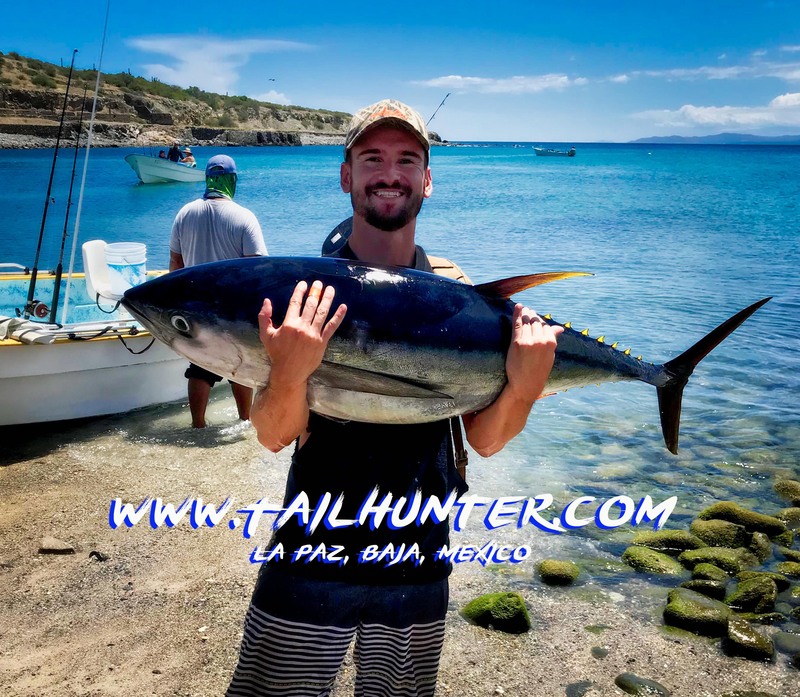 From Colorado, Chris got in on the tuna explosion just outside La Paz Bay that surprised everyone and resulted in this 60-pound class yellowfin! 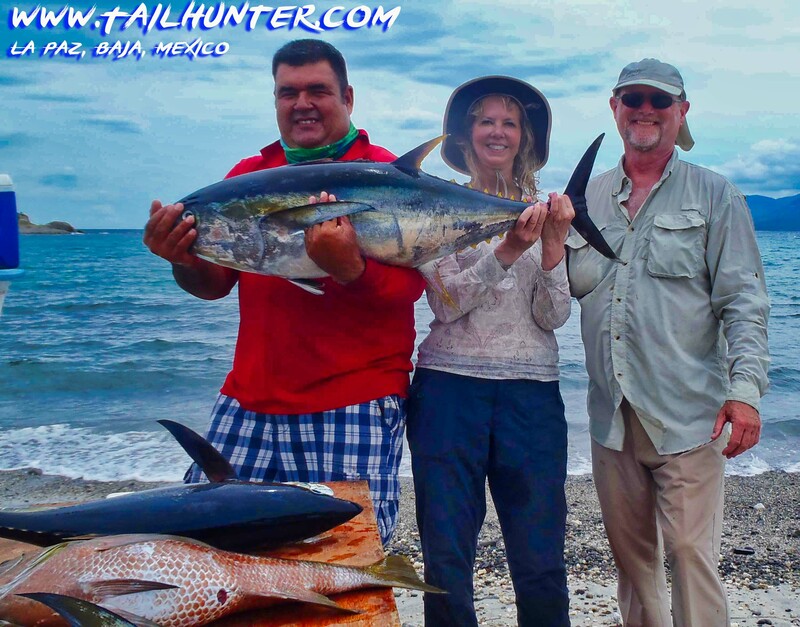 Captain Armando cranks out another big tuna with Steve and Ivy Carey. 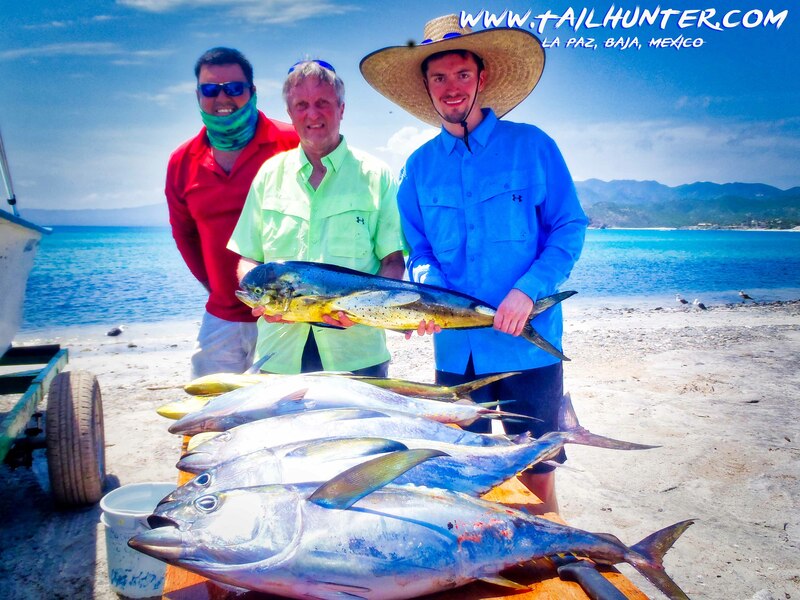 Check out the all the other fish on the table too! They’re from Marysville CA near Sacramento. 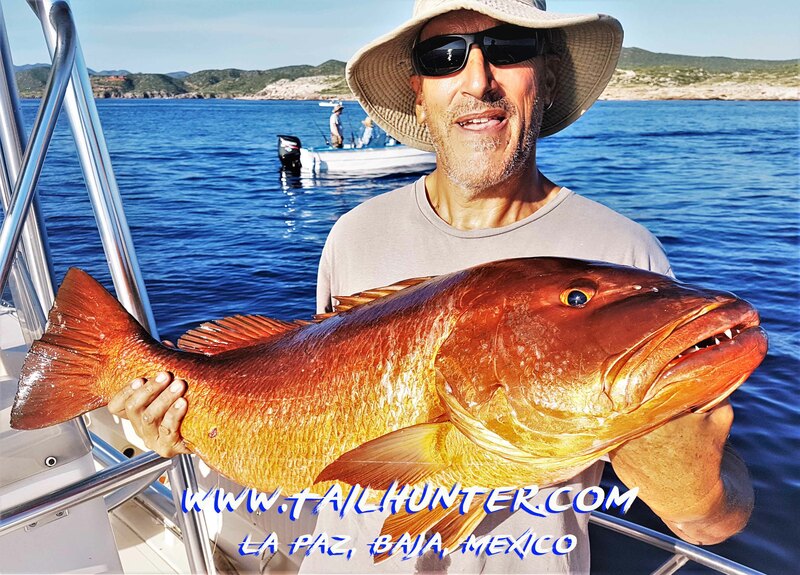 That’s a big rooster! 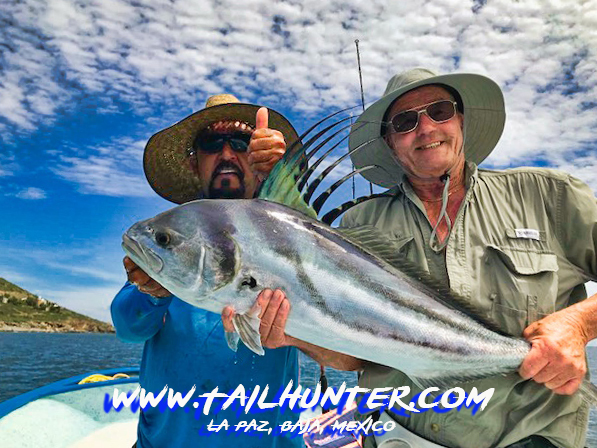 Dennis Wenholz and Captain Pancho were just off the rocks near Punta Perico when Dennis whacked this 80-pound class roosterfish. 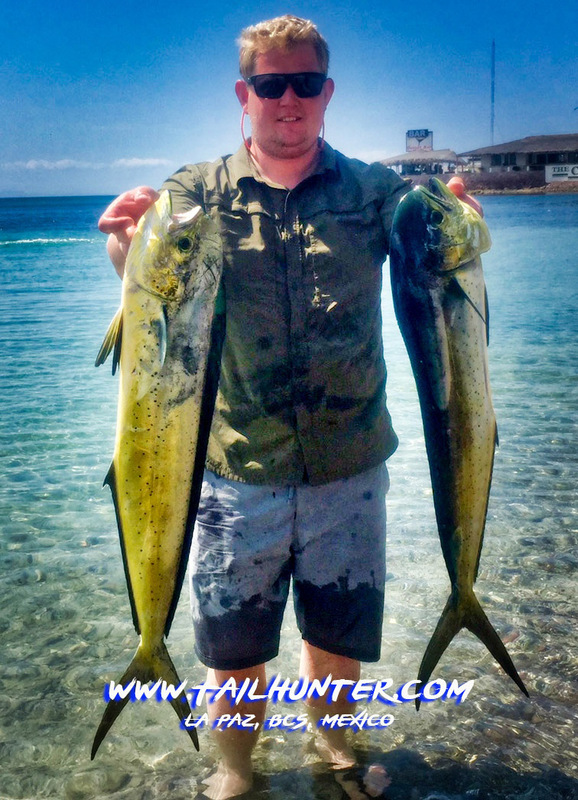 They fish swam off strong after being released! That’s the right kind! 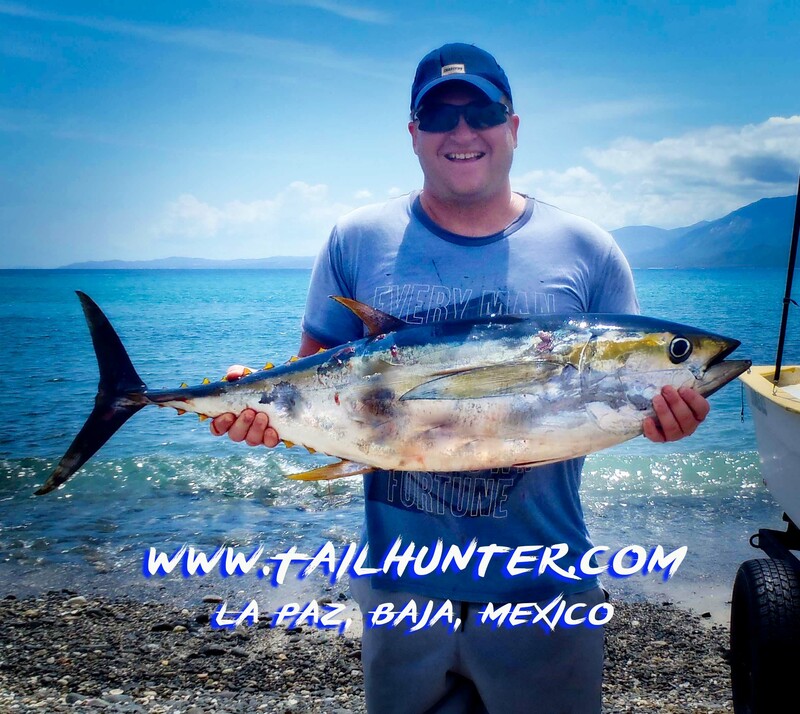 Dan Lewis from Lancaster started off his week right with this power rocket yellowfin tuna that he fought for almost an hour on light tackle just off the beach. 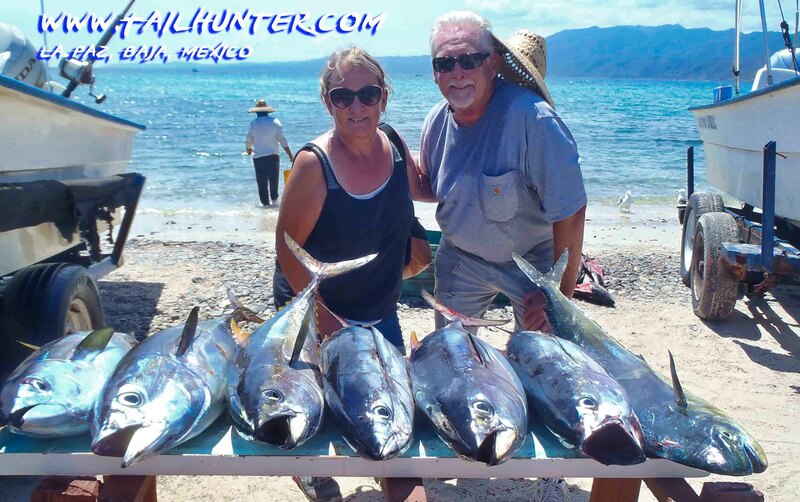 Our newest Washington friends, Clint and Gloria Carey (married over 50 years and still fishing buddies!) 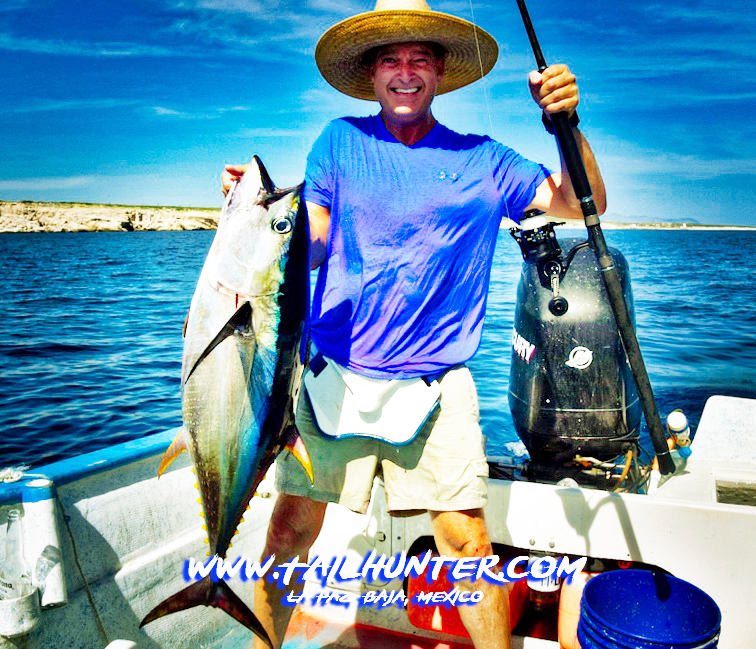 and some of their fat yellowfin. 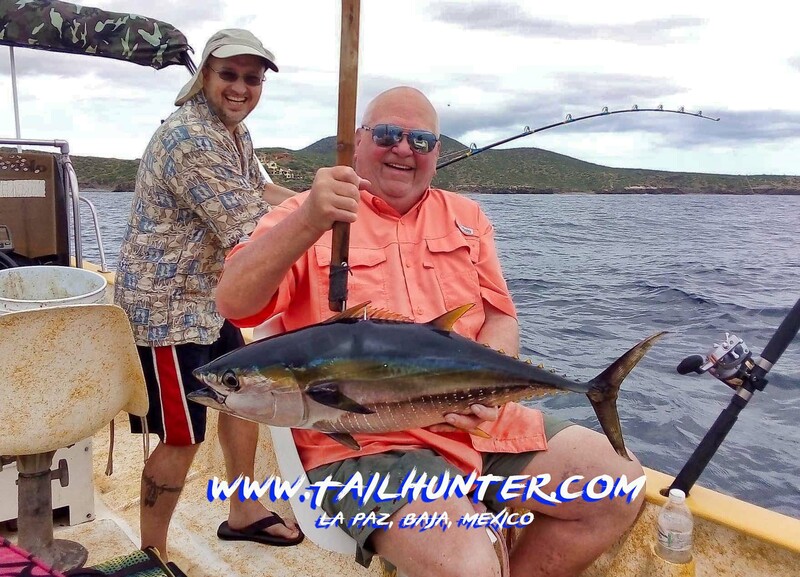 With ominous storm clouds brewing in the background that would shut us down early in the week, John Ehlers (visits us several times a year) watches Dennis Wenholz with another tuna! 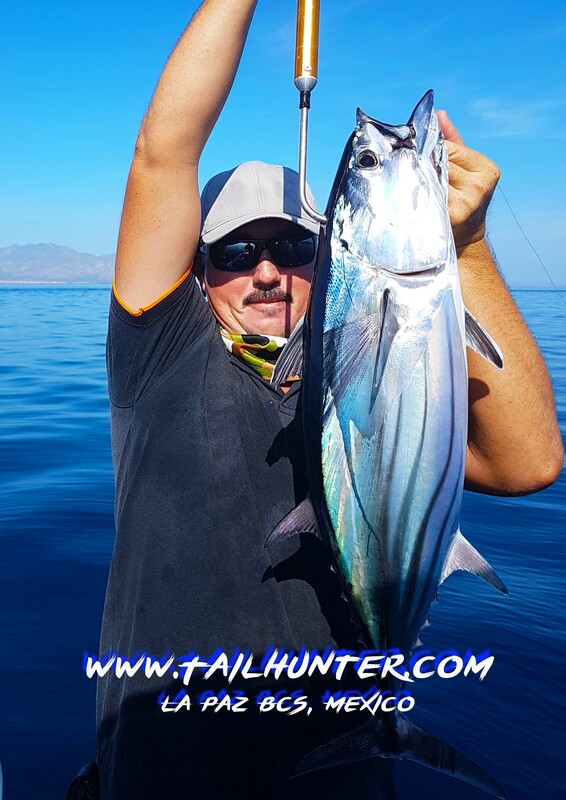 Andrew Suedkamp from Denver pulled out his flyrod the first day and whacked about a half-dozen species including this feisty bonito! 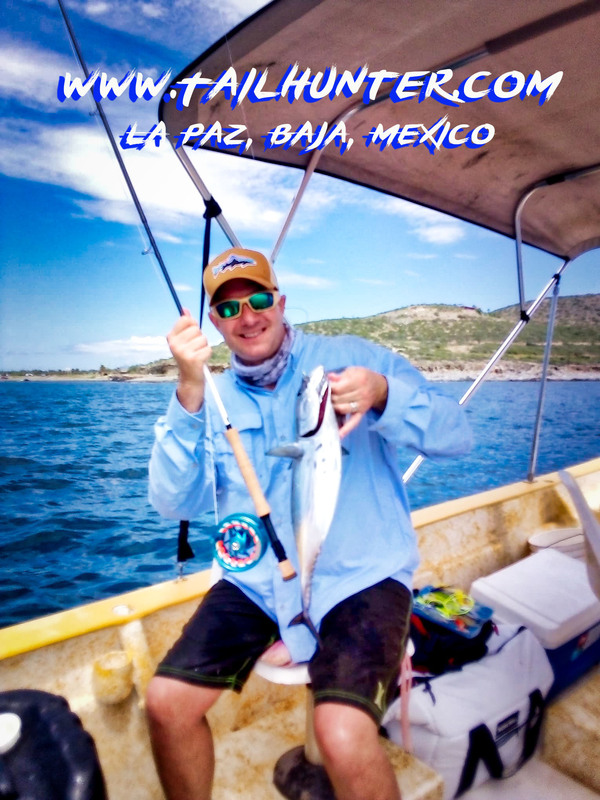 Andrew brought his whole gang of 16 from Ground Engineering Consultants for 3 days on the water. Great group! 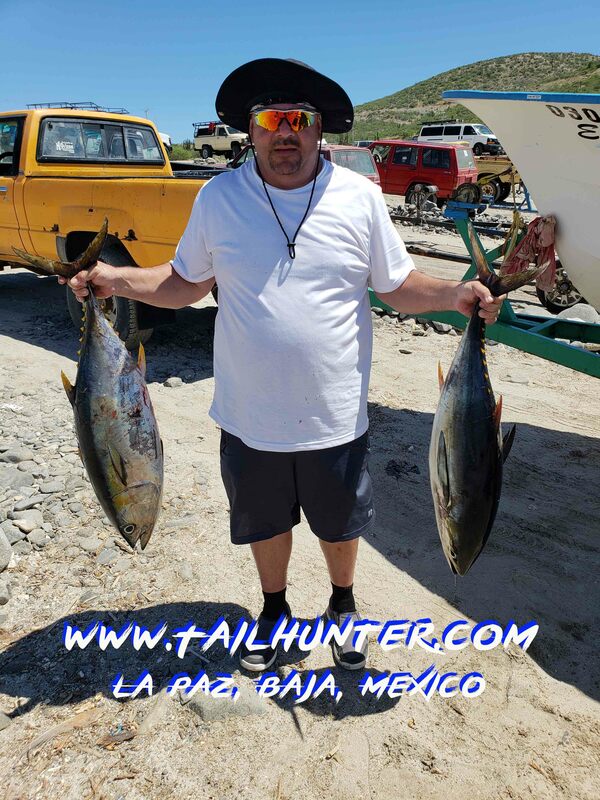 A double handful of dorado just before the storm hits for Art Sanchez from Victorville CA. They got in 3 good days of fishing before the weather arrived. 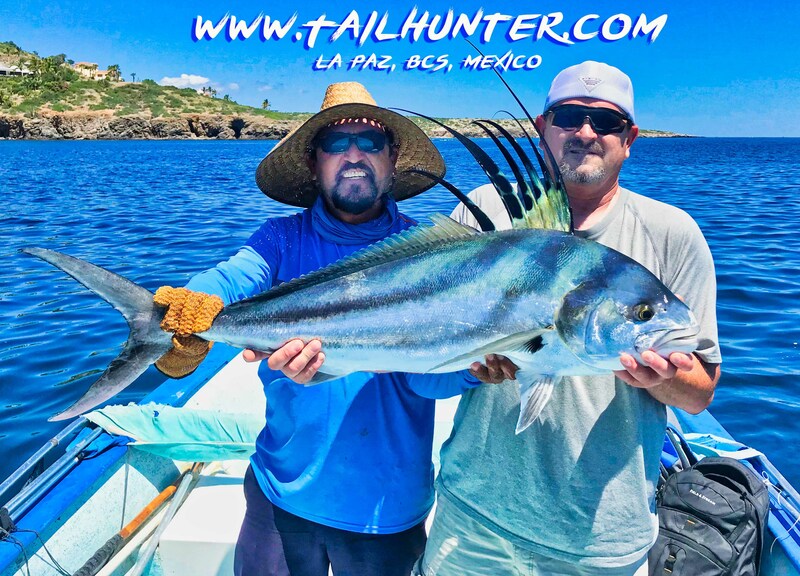 Two fun amigos from Oregon! 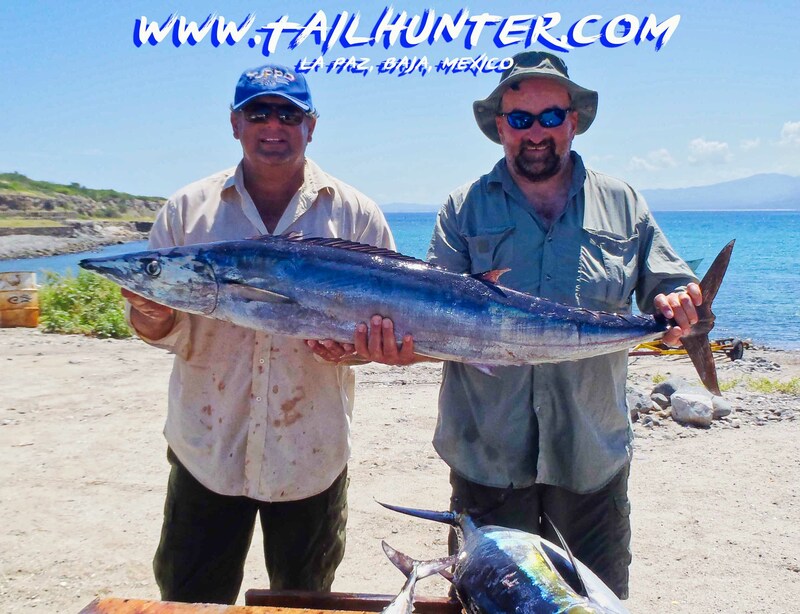 Back to visit us is Marty Sering who came along with buddy, Mat Large with two of their tuna from Punta Arenas. 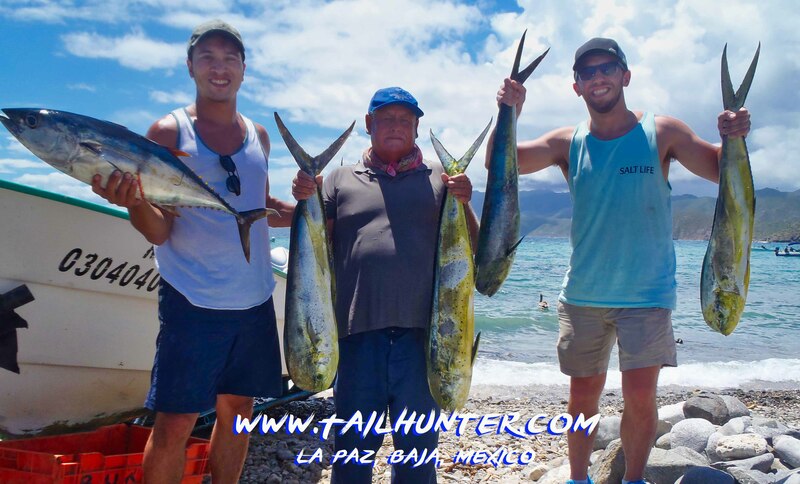 Elvin “EL” Momon was great fun to have visit us this week on his first fishing trip to La Paz and poses here with two of his yellowfin tuna. 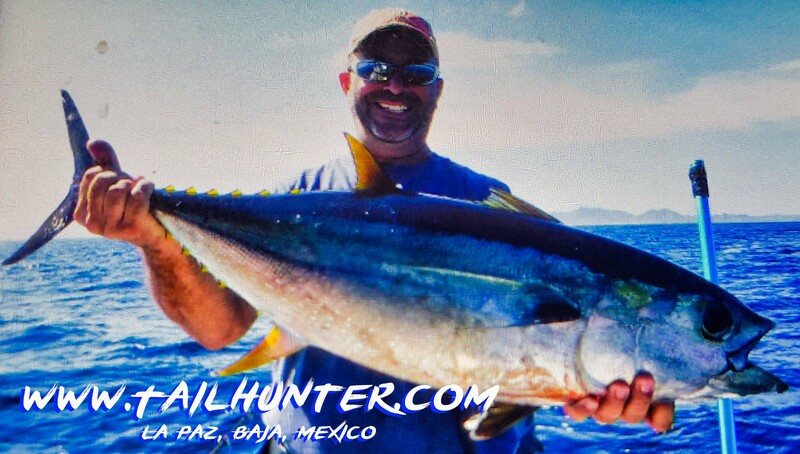 Great colors on Ivy Carey’s bull dorado just at the mouth of Muertos Bay. 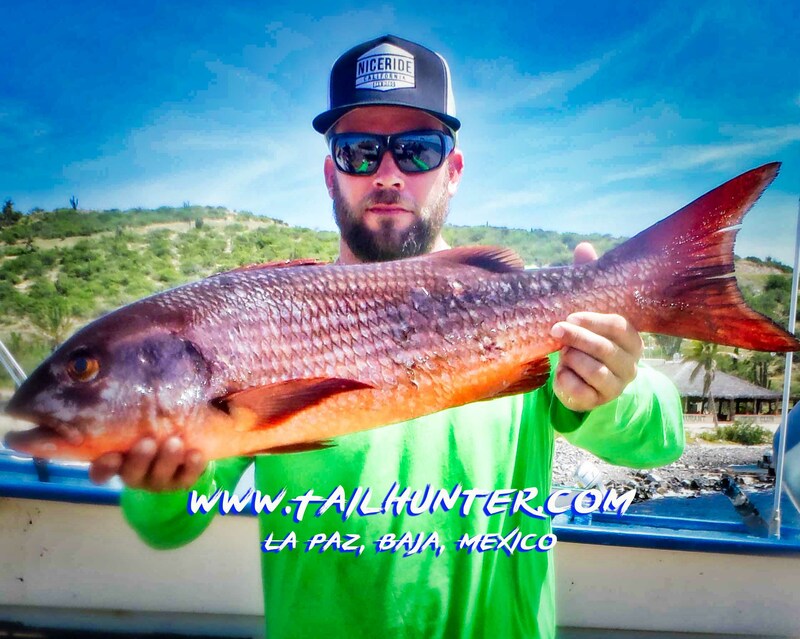 Headed for dinner at Tailhunter Restaurant. 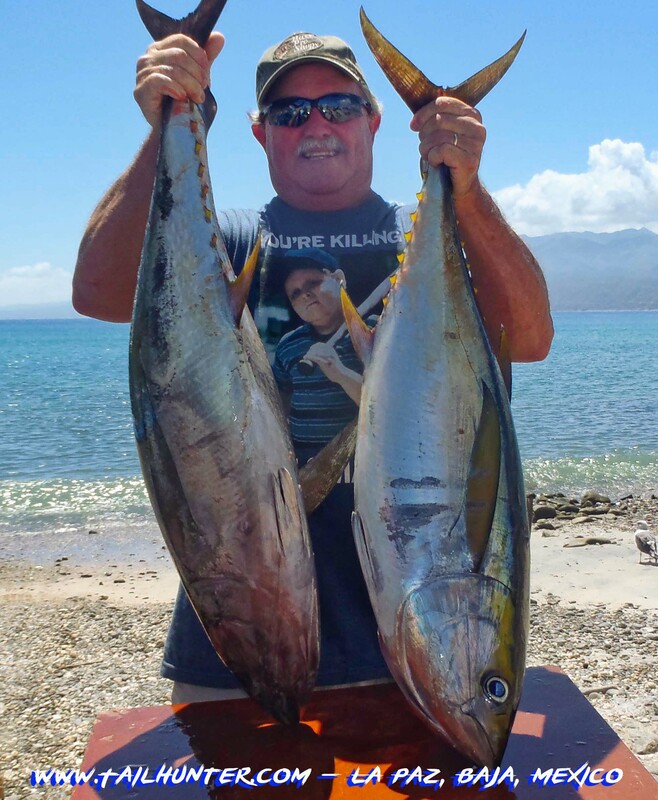 Phil Rachal has known us since way back in the day, almost 20 years ago and his first day knocked out these quality yellowfin tuna. He’s from W. Sacramento CA. 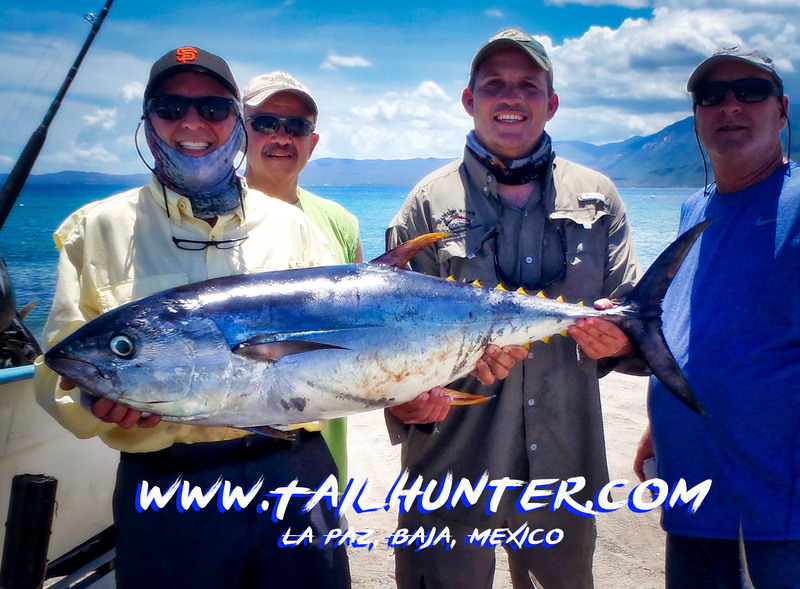 Nothing wrong with this tuna! Great colors and a smile from Mir Wong from San Diego. I love this photo!! It’s kinda self-explanatory! 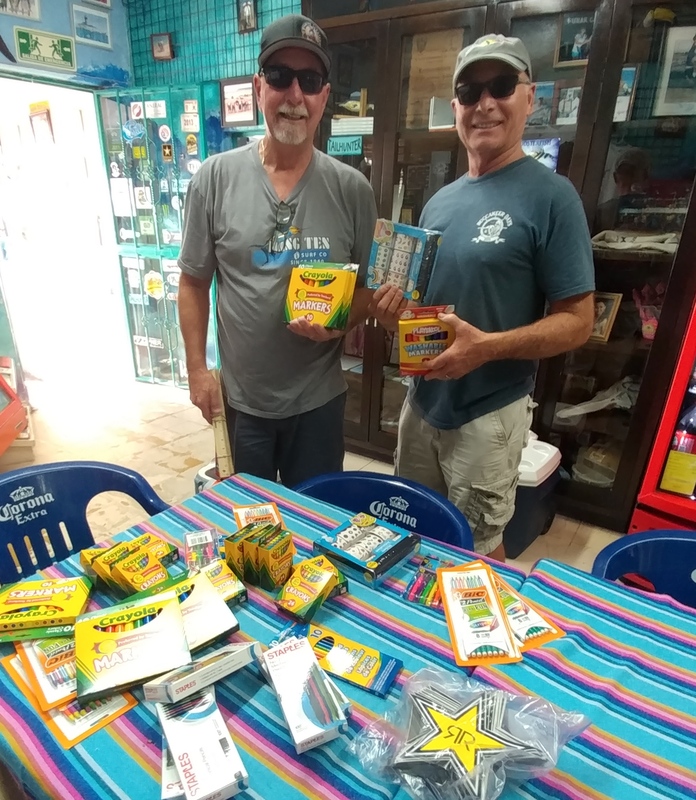 John Ehlers and Dennis Wenholz having a ball! 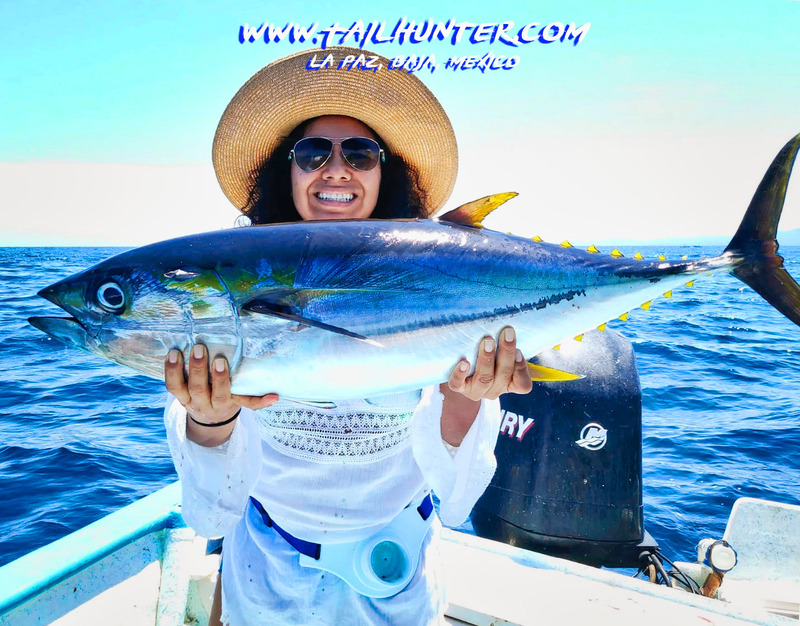 Ivy Carey looks a bit tired after battling this yellowfin tuna just a few hundred yards off the point. Posing here with Captain Armando. Big smiles . 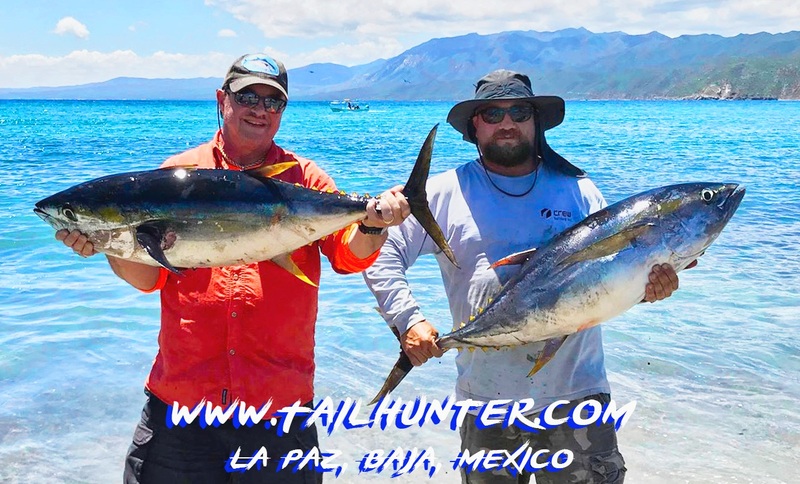 Captain Jorge and Clint Carey from Washington with 4 nice models of tuna! Good shot! 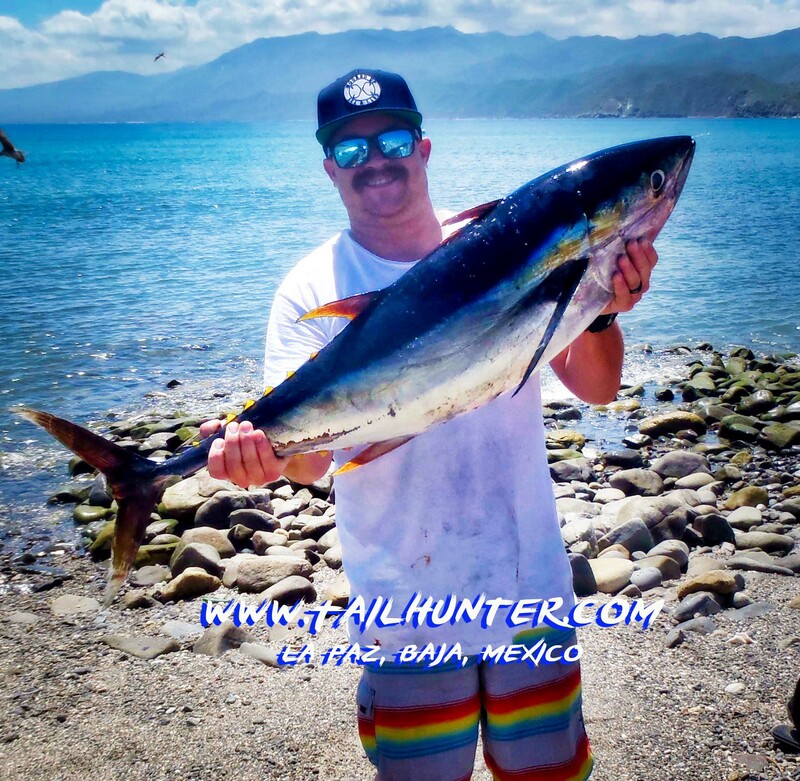 Good tuna. 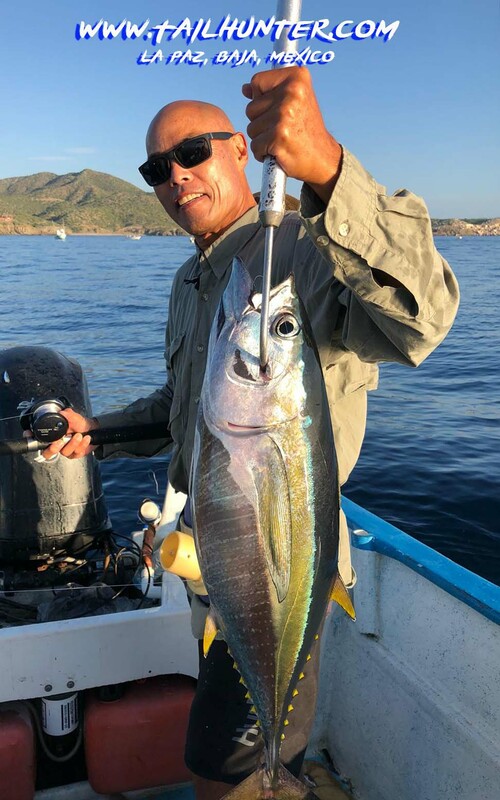 Craig Wong from San Diego with another YFT! Colorado in the house! 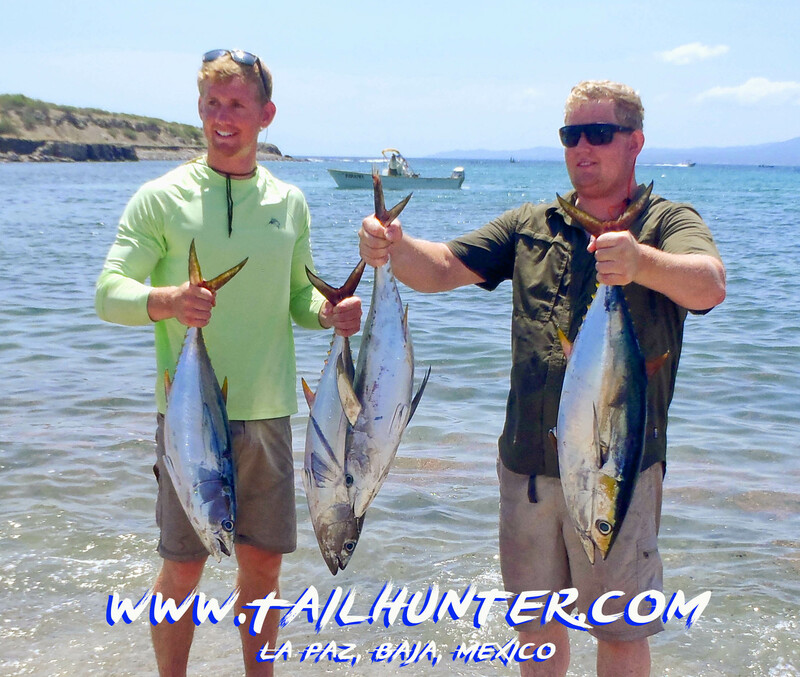 Tuna and dorado for Joe Zorack and Aaron Klingsworth. 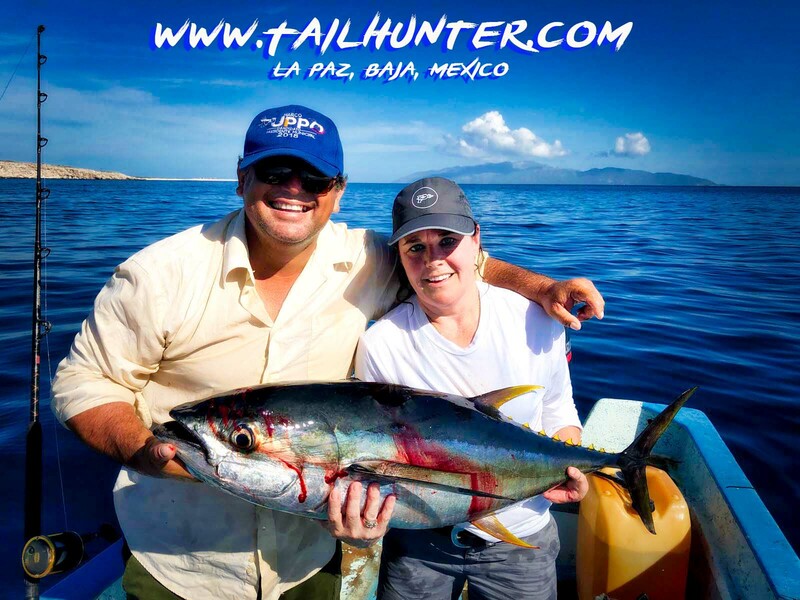 Captain Gerardo shows give Debbie Omstead a hand with her big yellowfin tuna. Dave Sealy looks on. They’re from Alaska and even Dave noted how rough the waters got before the storm hit us. 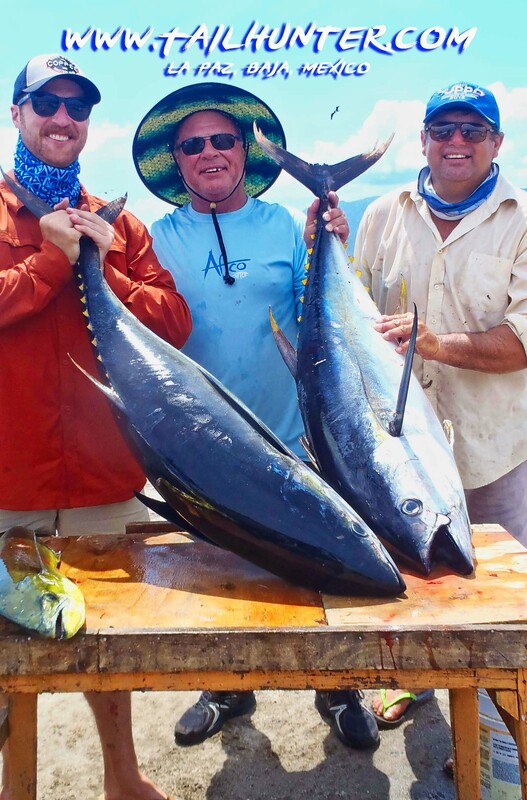 Good way to start the week for Brian Hudson and Andrew Suedkamp and some football yellowfin! Good-bye summer and hello to the fall! 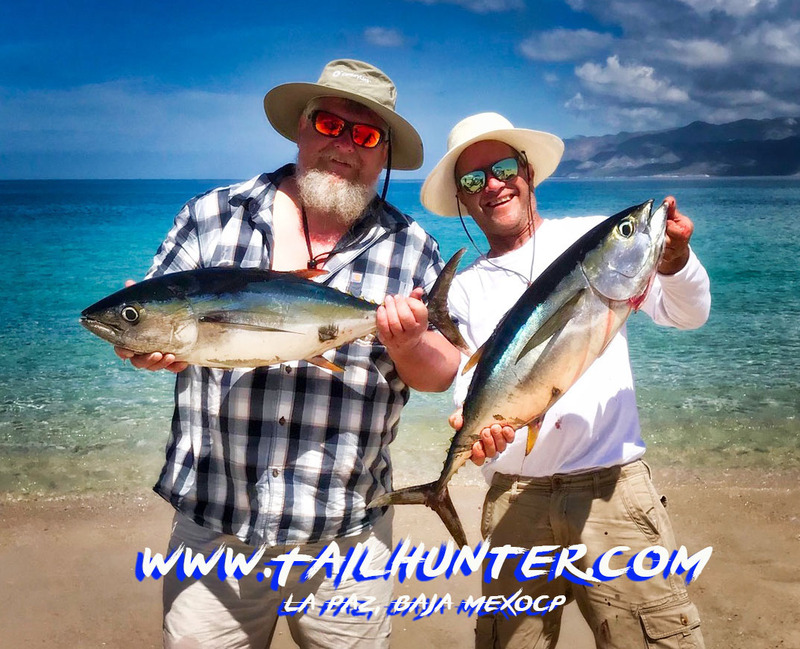 We’ve had an excellent bite for the last few weeks, especially on tuna so when the forecast said we might have a “little rain” we expected that usual afternoon localized showers of short duration or the occasional little thunder and lightning cloudburst. What we got instead wasn’t a hurricane or anything that dramatic. But we got almost 2 days of wetness that included heavy rain or drizzle that just never stopped! We have had hurricanes in the past with lashing torrential rain that might last 4 of 5 hours…and then it’s done! But at one point this week it rained for about 27 hours! We were telling our Oregon and Washington clients that they brought their weather from the Pacific Northwest down here. We also had some strong gusts of wind and some big seas to go along with it! 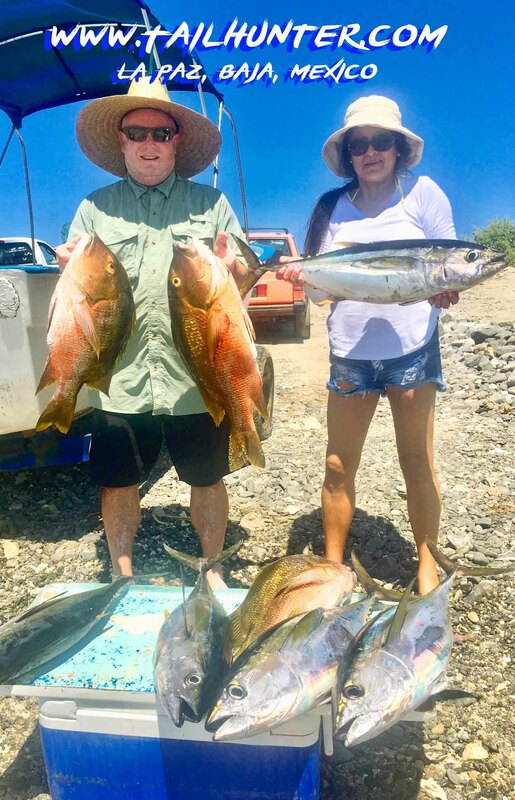 It didn’t do us any favors for fishing although the desert has exploded with green everywhere and flowers are in full bloom! 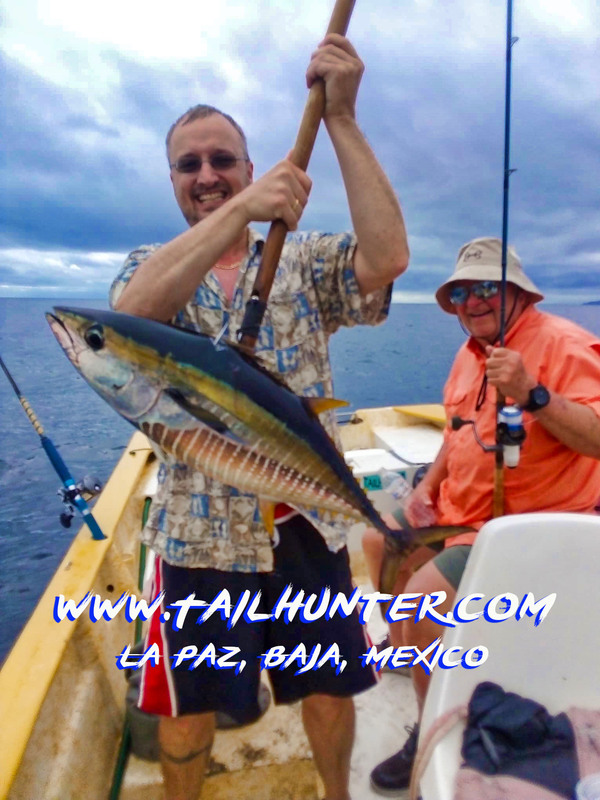 Even as the storm approached the fish kept biting, but then well…it became just too rough and the port captain even shut down all boat traffic and that was it for us . We had to keep everyone on shore for a day. No fishing. That always worries me because you never know what a storm will do to the waters and the fishing. Will the waters be dirty? Will there be a lot of runoff? Will there be a lot of debris in the water? 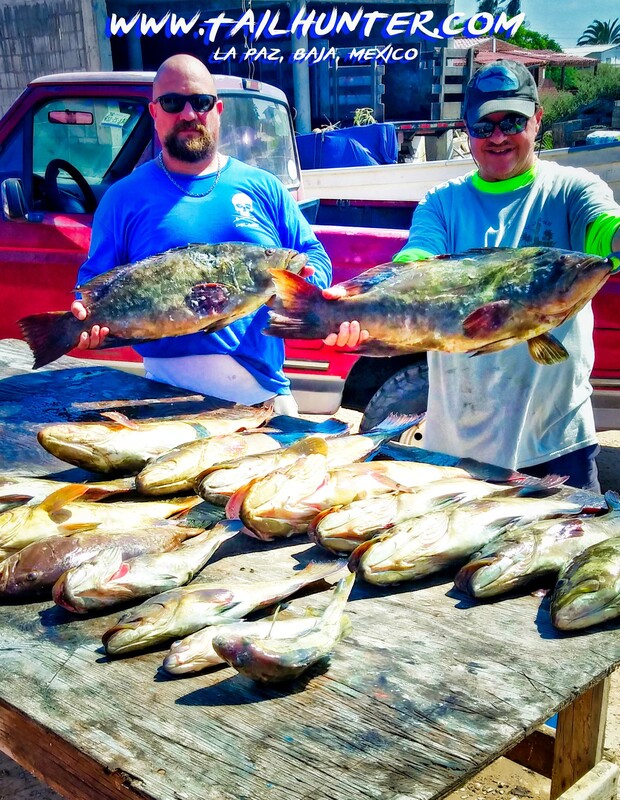 What about water temps and bait? Lots of variables! 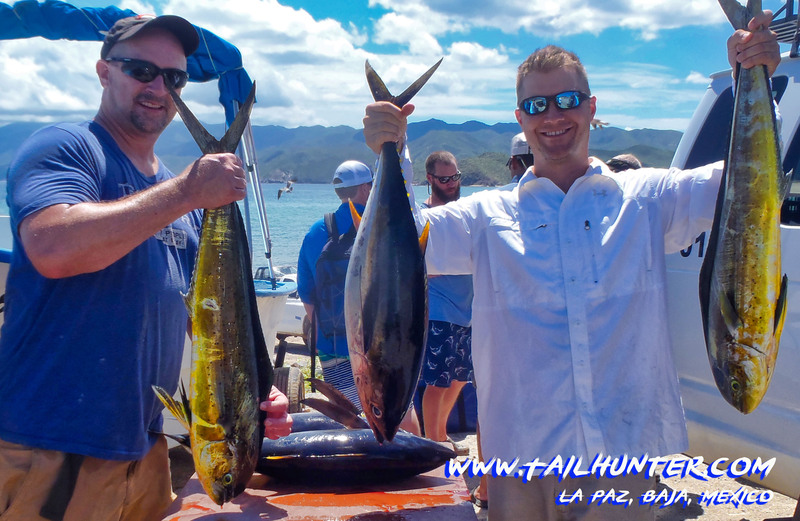 Well, we hit the water on Thursday and while fishing wasn’t up to par, we still got into fish. Much better than I anticipated. By Friday, we were back on our game for the most part. 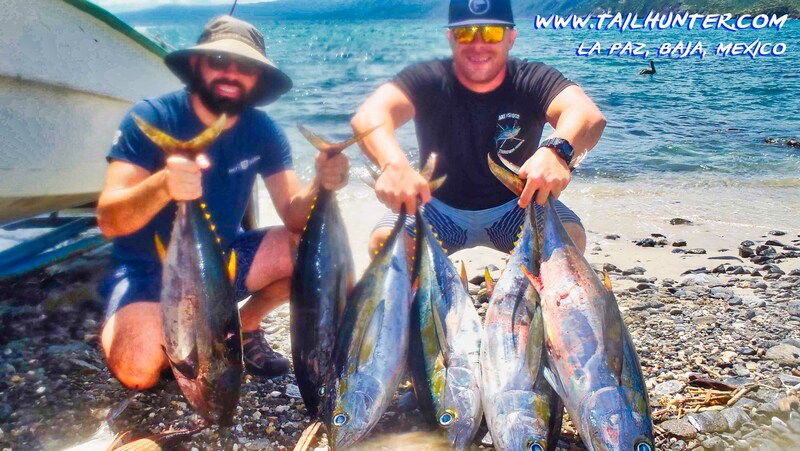 With each passing day away from the storm, the tuna came back harder. 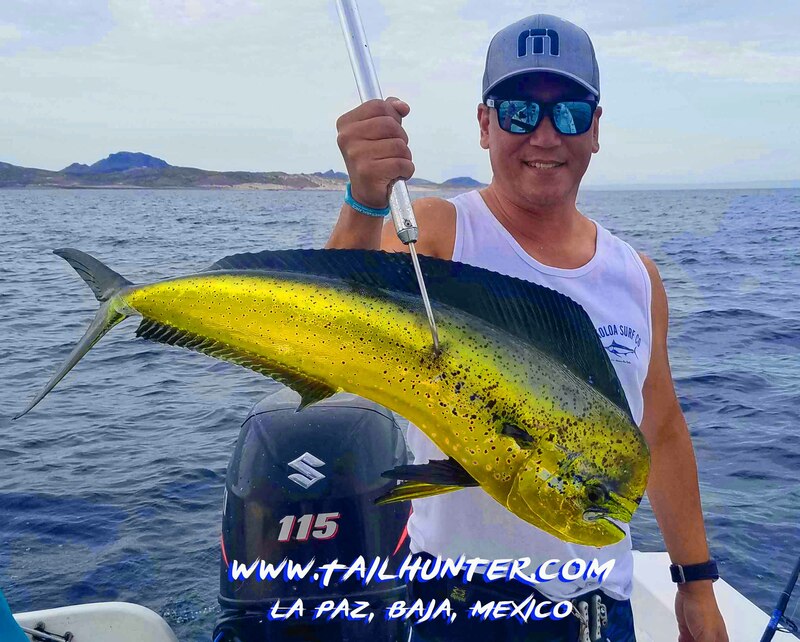 The dorado were more willing to bite. Just overall better fishing. 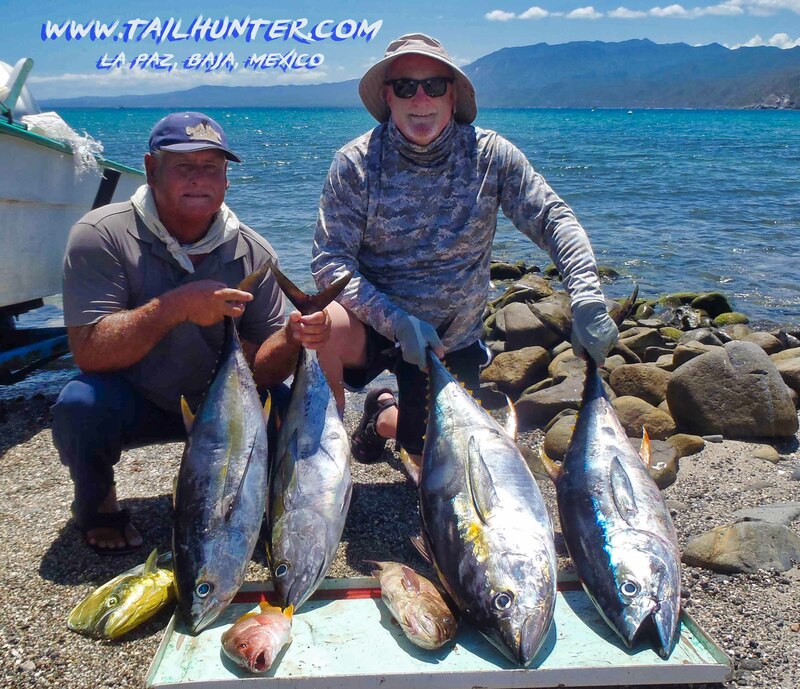 The tuna bite has generally been mostly with our Taihunter Las Arenas/ Muertos Bay Fleet all season. 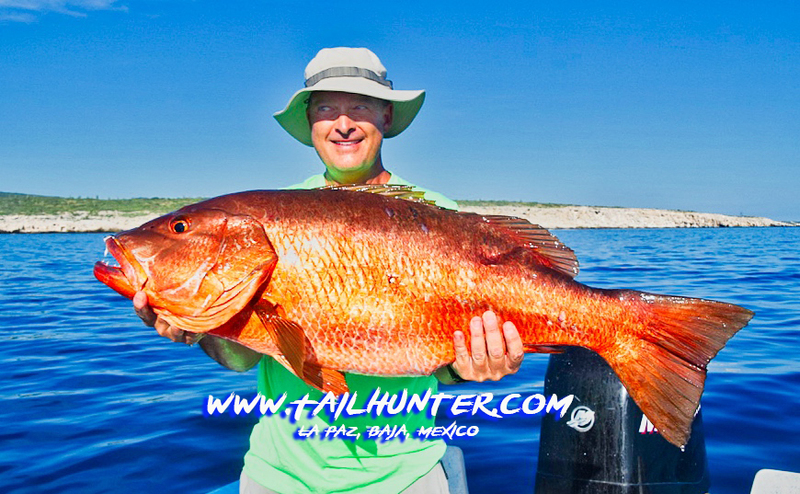 Fish between 10 and 100 pounds have been the general rule and it’s been very very good for about a month. 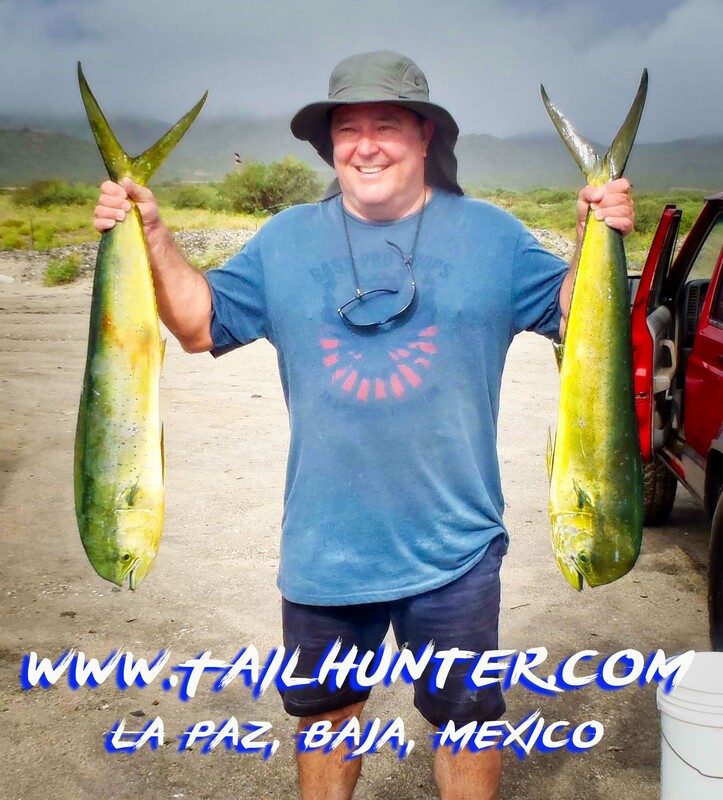 Mixed with dorado, pargo, cabrilla and a few other species, it’s been solid. 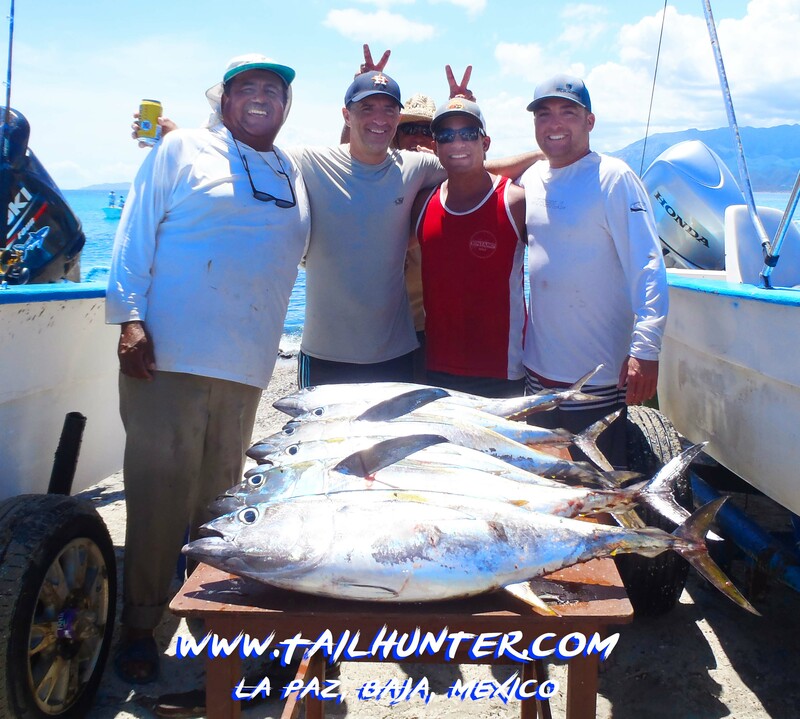 But the big surprise this week was with our Tailhunter La Paz Fleet! 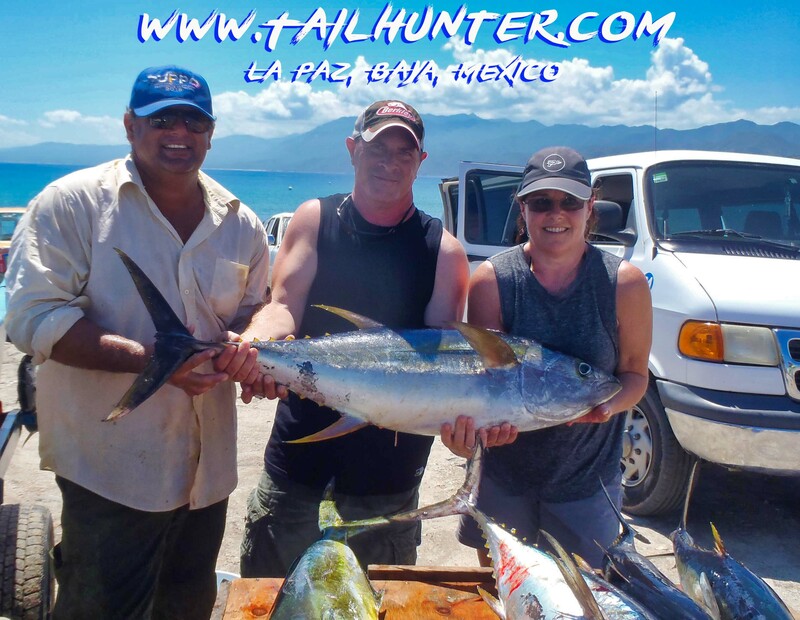 Out’ve La Paz Bay, most of the fishing is dorado fishing. 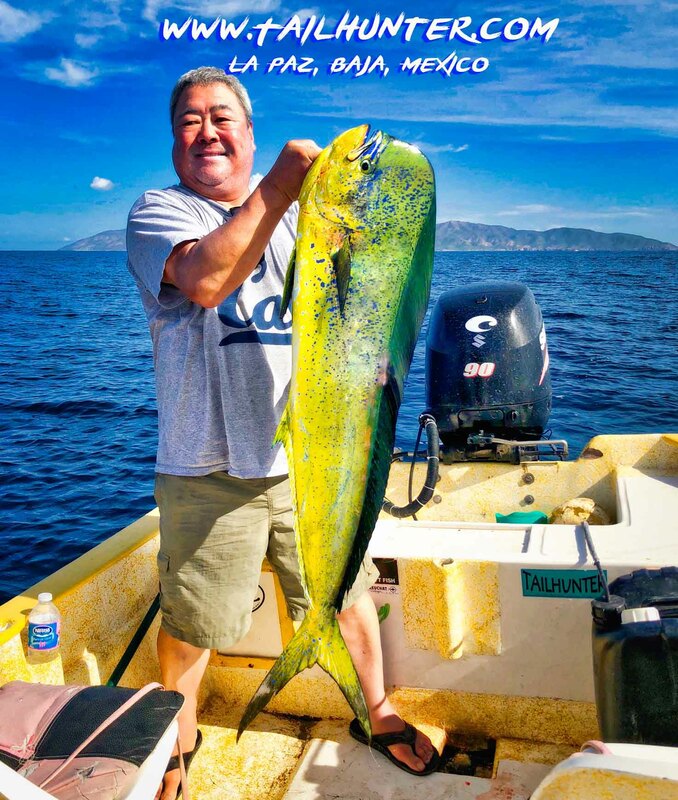 Probably 90% of the catch is dorado. 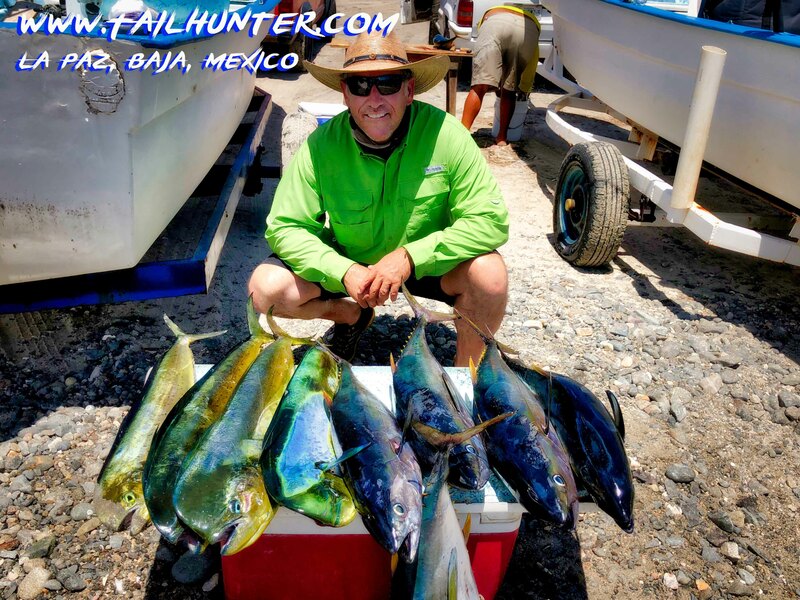 It’s the “honey hole” for mahi mahi! 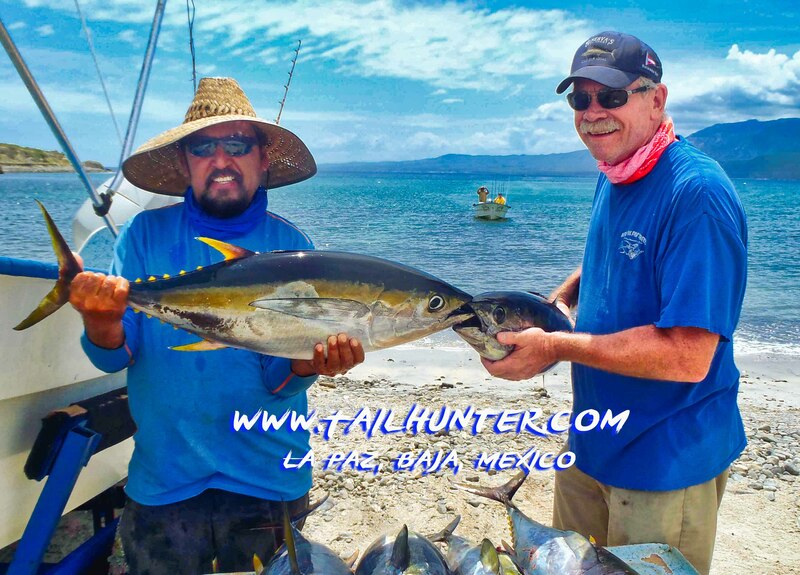 Well, this season we’ve little jags of tuna here and there. Pretty surprising all by itself and a nice bonus. 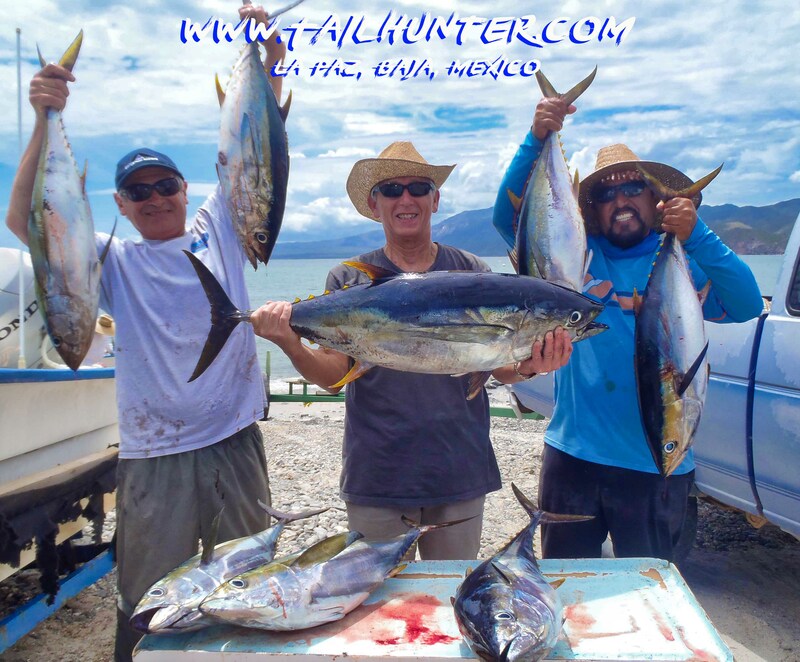 But, this past week, we had entire areas bust loose with boiling, foaming tuna! 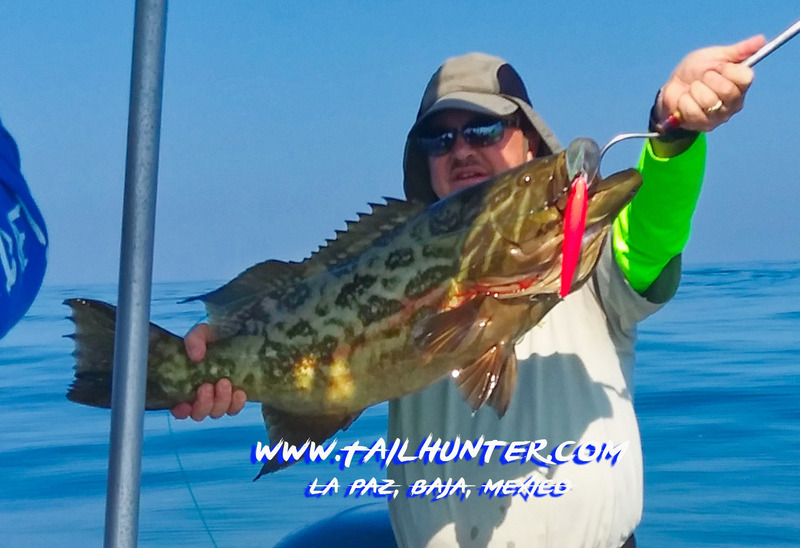 Fish between 20 and 60 pound just blasting out’ve the water and slamming every bait tossed in the water! Friday this past week was especially explosive! 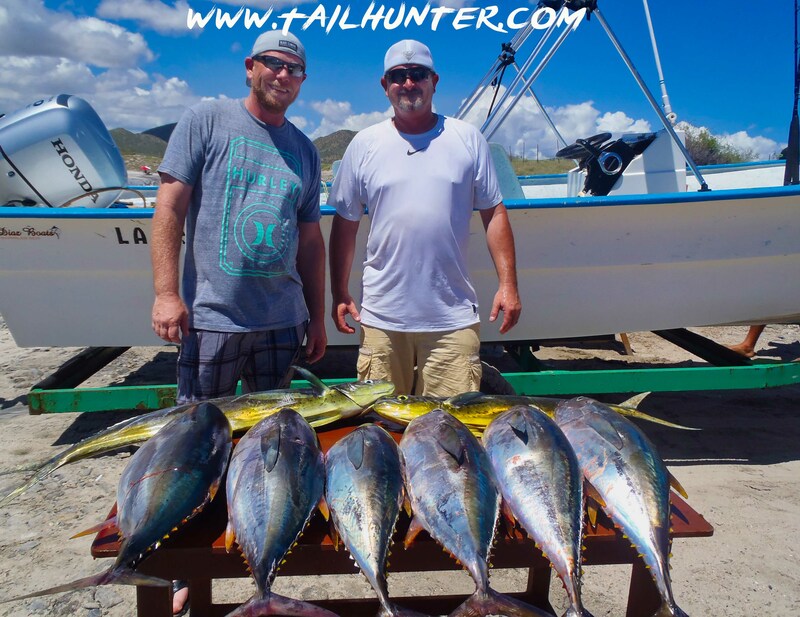 In 23 years down here ,I’ve never seen so many tuna! Hope it continues. We might get s’more showers this week, but nothing major like this last week where the first 3 days of the week were pretty much in the dumps because of weather. Air temps are cooling. Most day only in the mid-90’s. However, the humidity has been incredible! One morning at 5 a.m. when we were sending out our fishermen it was 92% humidity. One evening at midnight it was 88% humidity! 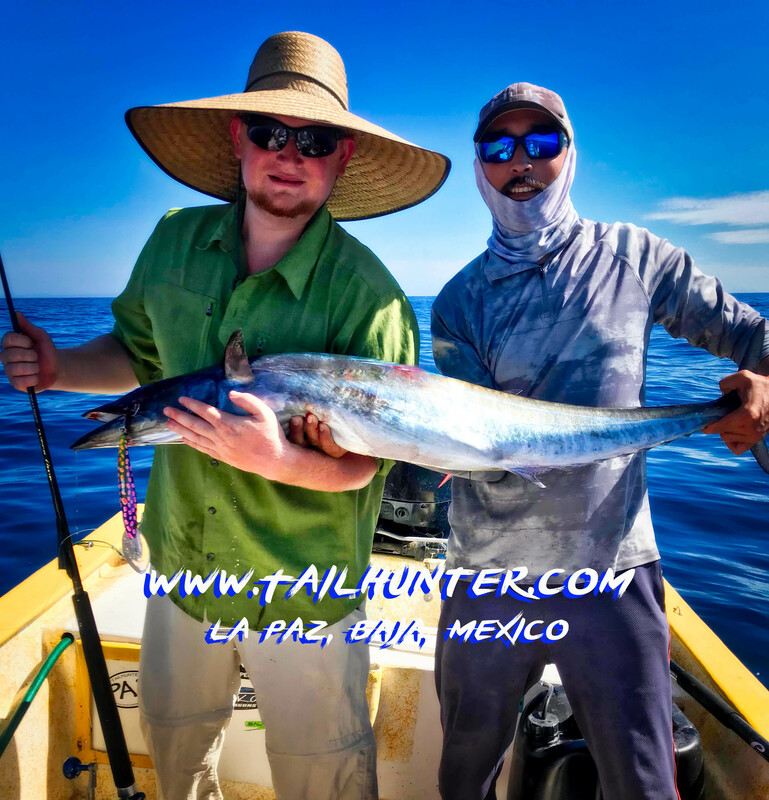 Water – Blue and warm with surface temps at 86 degrees but lower thermoclines might be cooling off since we’re seeing some species biting like pargo, pompano and sierra that we normally only see in the springtime when waters are cooler. Weather – Pretty much every day, the forecast calls for some rain. But this time of year, that really doesn’t mean much. 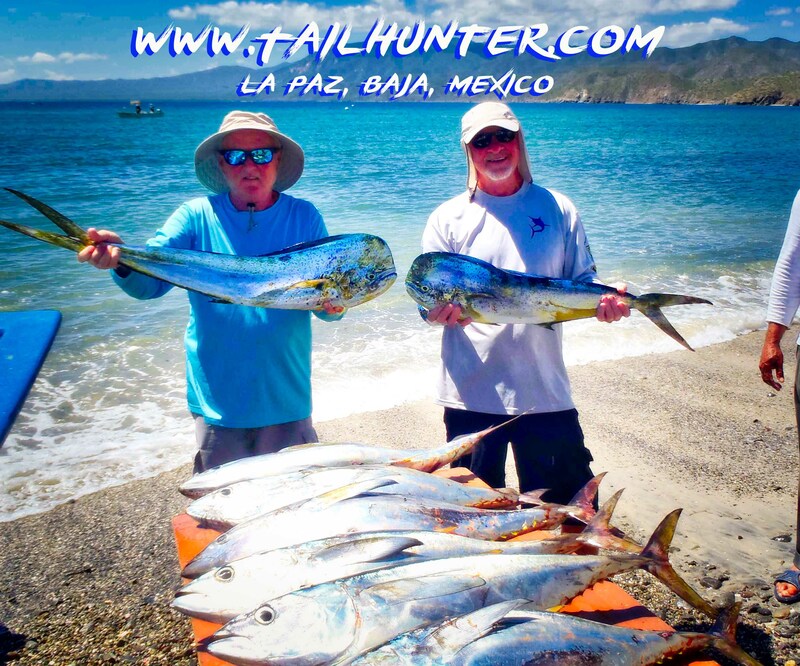 It could be raining in the mountains or across the bay, but technically, it’s still “raining in La Paz. ” We get some lightning in the mornings from the heat then it mostly clears up. Then, afternoons, the thunderheads build and there’s some localized showers here and there. Then, it clears up to a great sunset. Mostly! Now then it rains hard! Humidity is a scorcher . At 4:30 in the morning the other day it was 94% humidity. Like a fog of heavy air! Then, it got better. 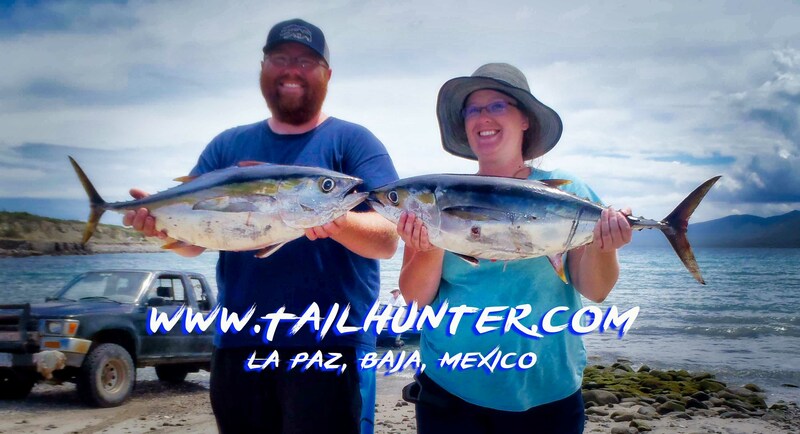 Fishing – Crazy tuna biters! 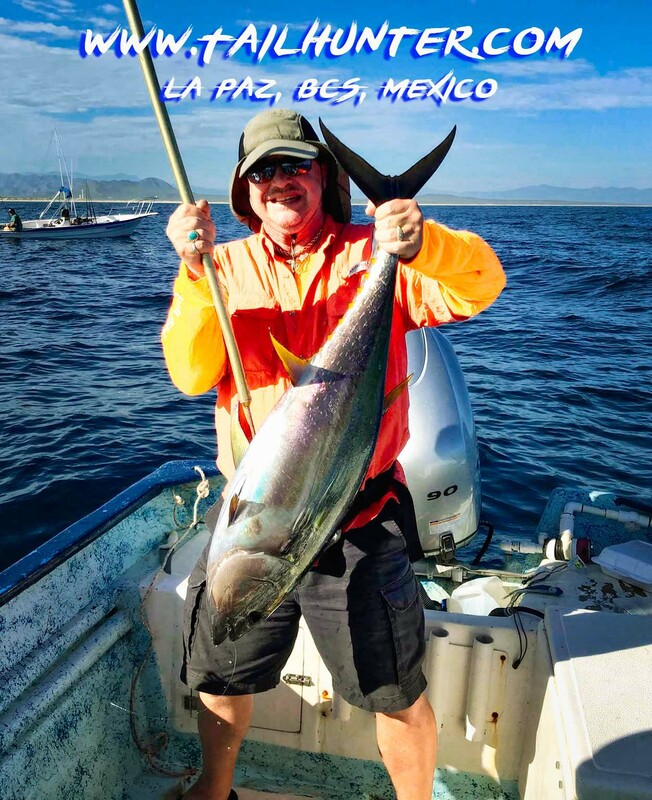 Las Arenas still producing tuna very nicely between 5 – 100 pounds off Muertos Bay, the Arenas lighthouse, the opening of the bay, Punta Perico and the south end of Cerralvo Island. 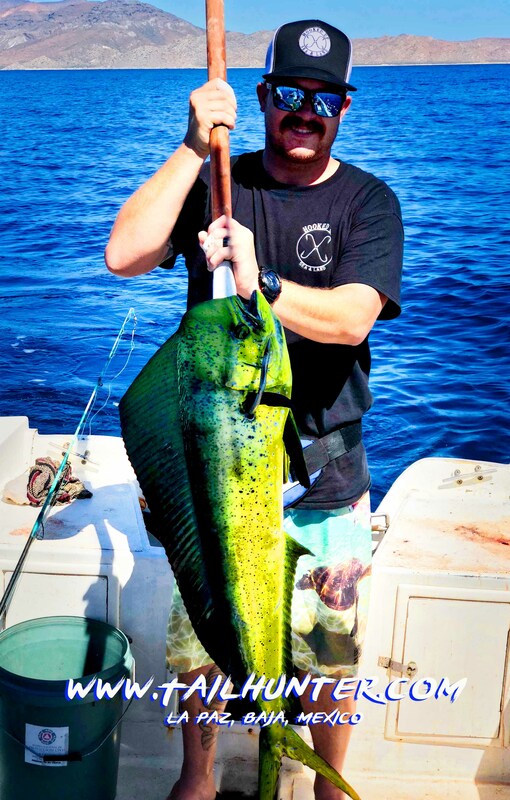 Some fish are fun. Some want to kill you! LOL. Not kidding. Stay hydrated. 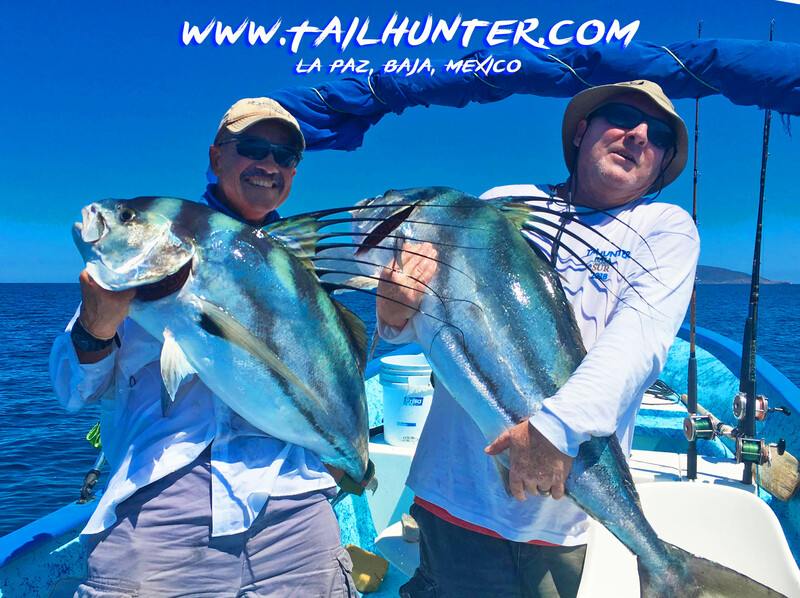 Have had several folks pretty much keel over from the heat; fighting fish and not drinking enough water (not beer!) WATER!!! All goggle-eyed and delirious cuz their brains were getting friend. Almost had to call the ambulances. Know when to way when! 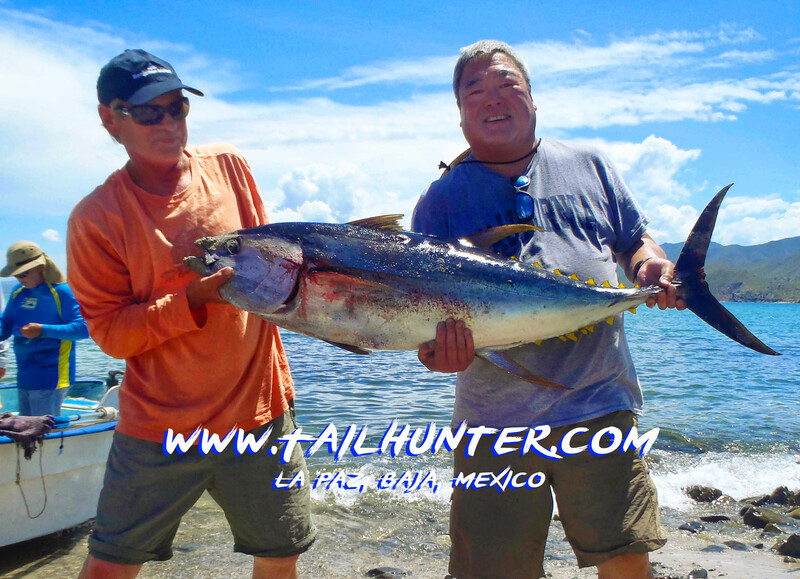 Catching – Dang, we lost some big tuna over 100 pounds this week. Heartbreaking, especially after long fights and getting the fish close to the boat! Yea…this is the right kinda! 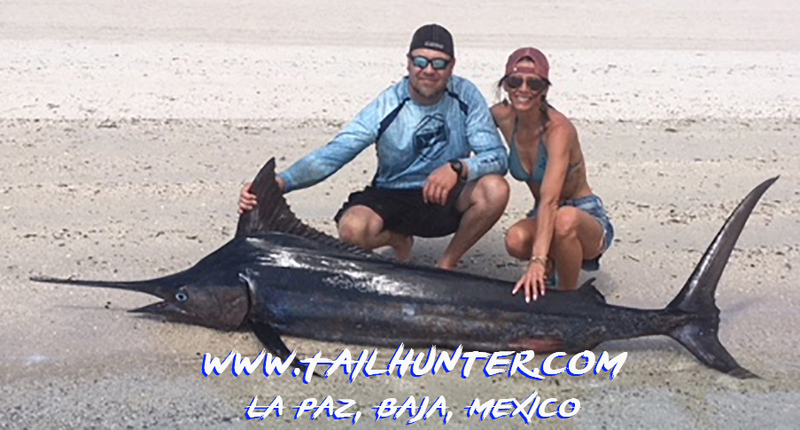 Jeffrey and Michelle Martin came all the way from Michigan and had just one day to fish and stuck it! 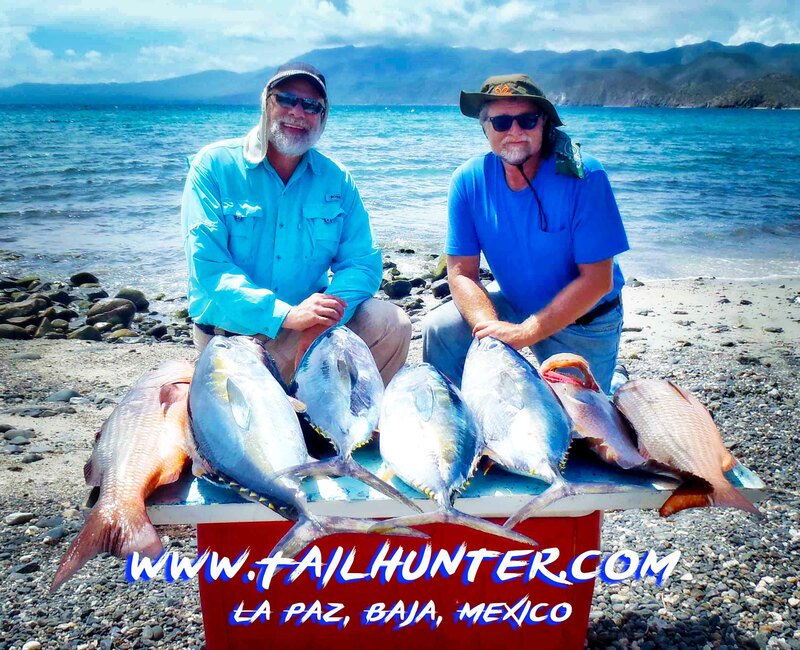 Two huge tuna for the coolers out’ve Bahia de los Muertos! 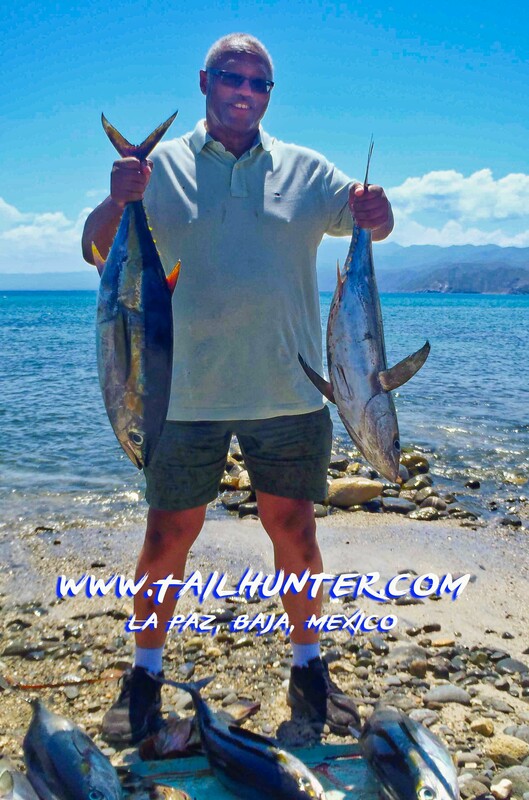 Paul Nagata, is our long-time amigo from San Francisco and tries to fish twice a year in La Paz with the Tailhunter Fleet. 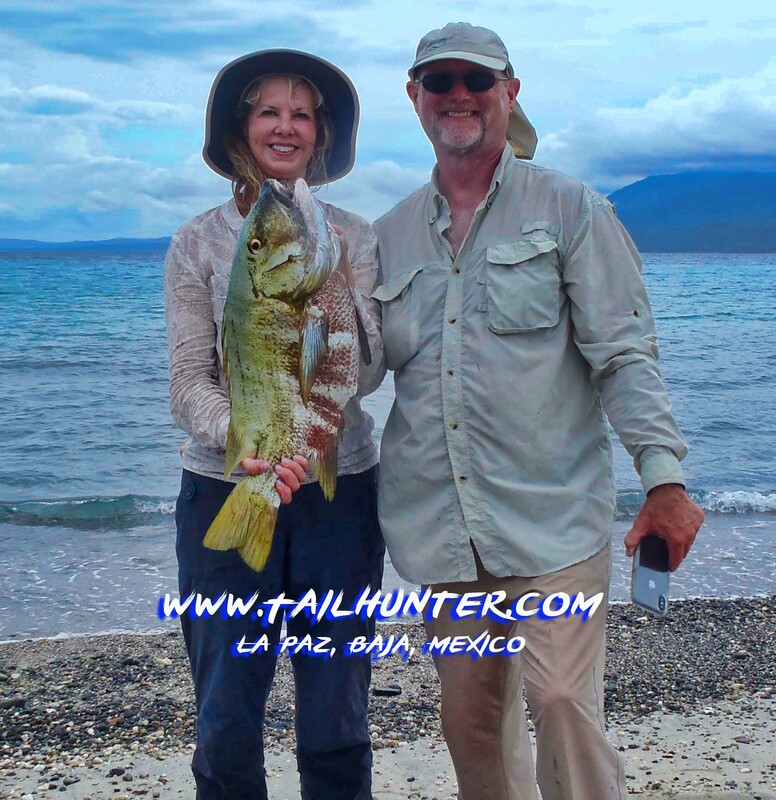 He shows off a gorgeous dorado he caught just outside of Bahia de los Muertos near Punta arenas on a live sardine. Here’s trouble! 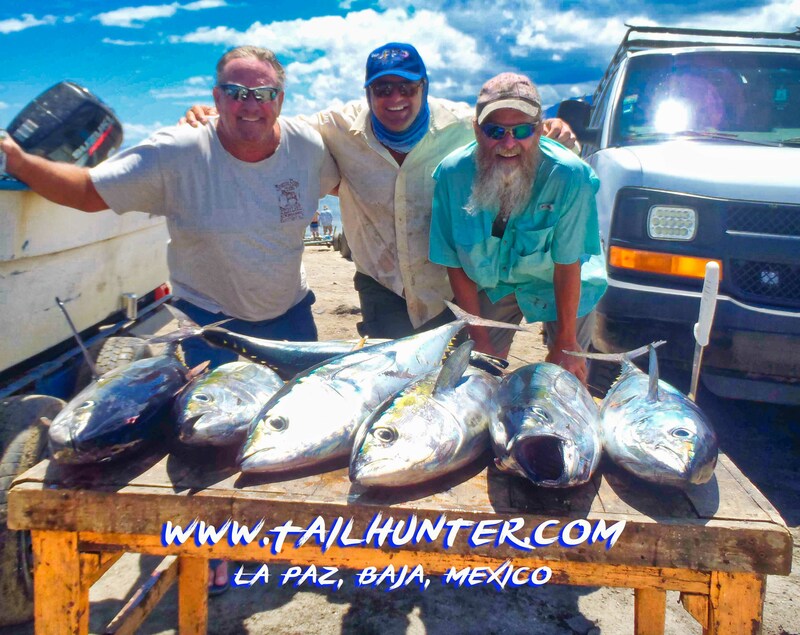 Captain Armando with Jim Andrews and Terry Hudson after a nice day of fat tuna! 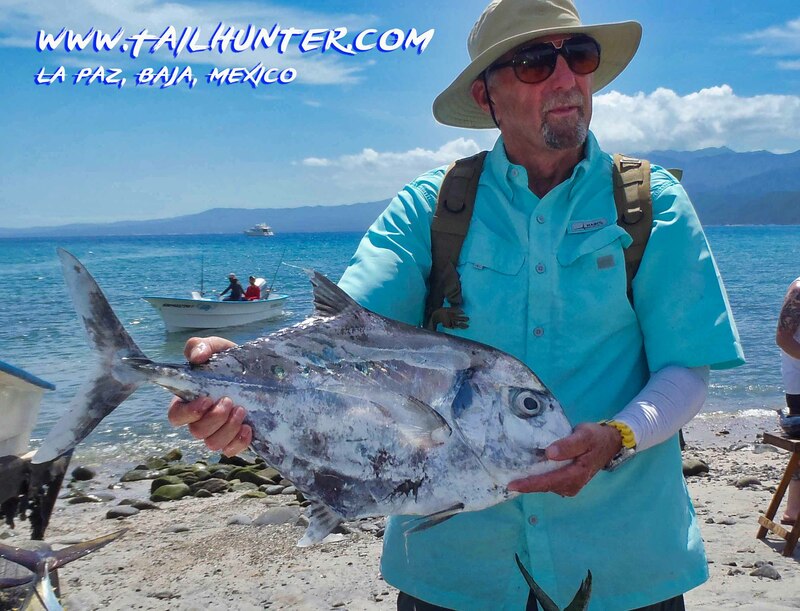 Leif Dover, our Georgia amigo from Atlanta with another nice fish to add to the many he has caught over the year. 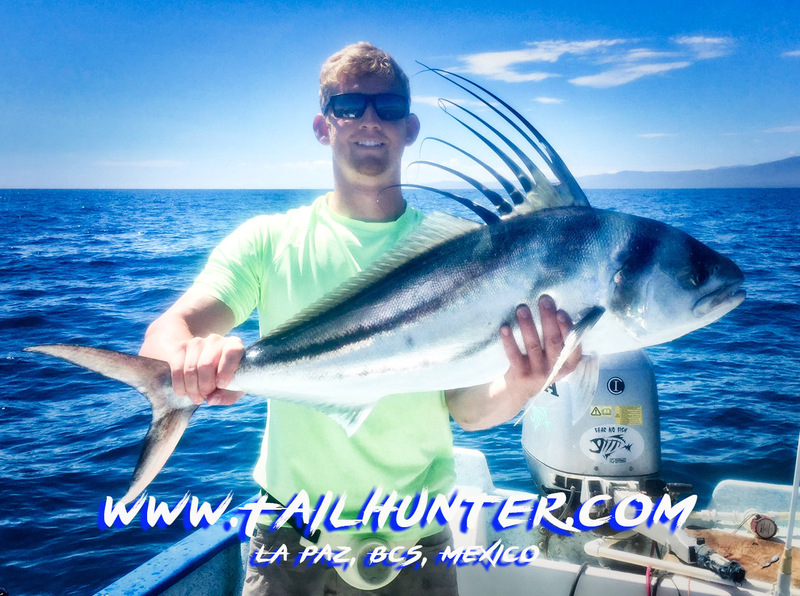 Roosterfish in the boat then photo’d and released! 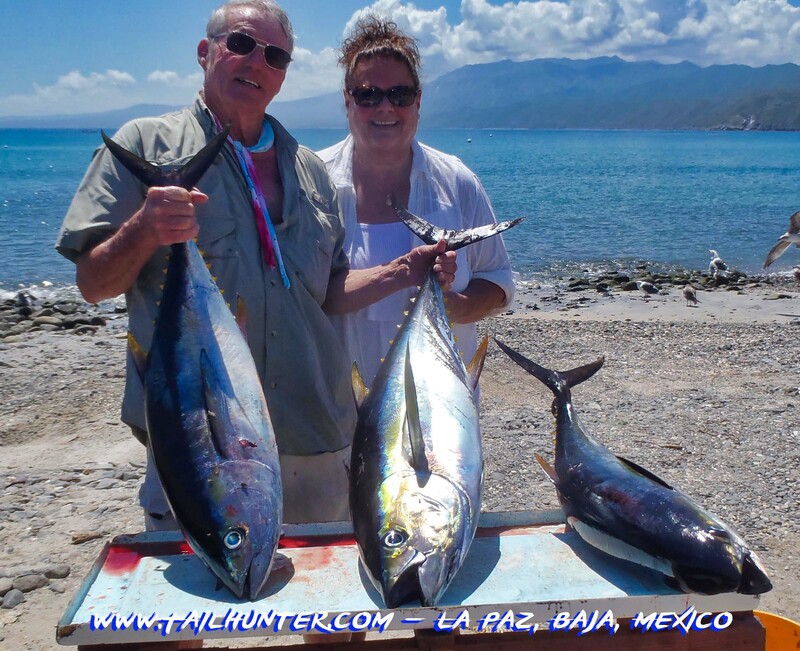 Our new Tehachapi CA friends on their first visit to us, Frank and Annette Brooke had a really good first day with tuna and a nice dorado. 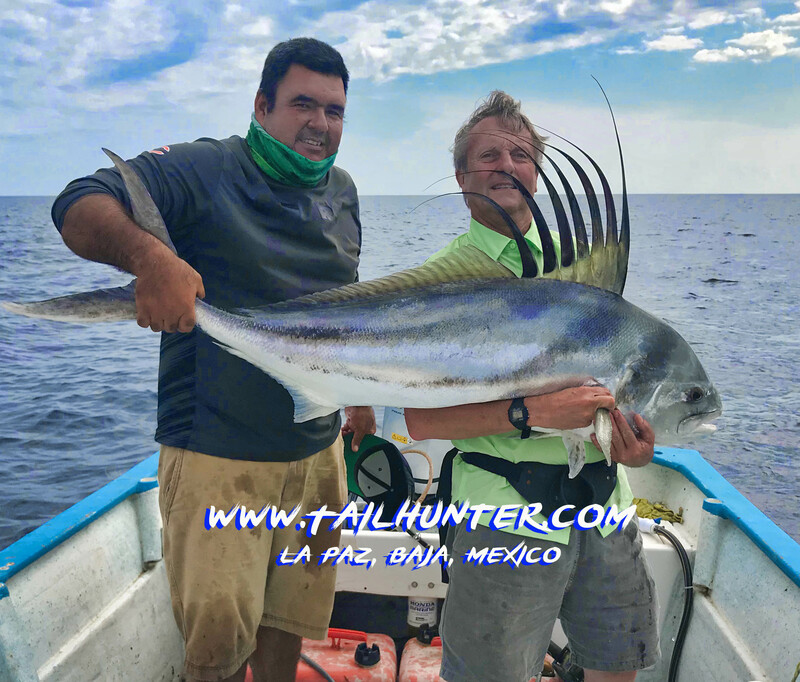 Jim Stahlman from Boise, Idaho was joined by brother, Jeff from Pennslyvania and had quite a variety during their week with us including tuna, pargo, cabrilla, and also dorado (not shown) as well as roosterfish (released). That’s alot of meat! 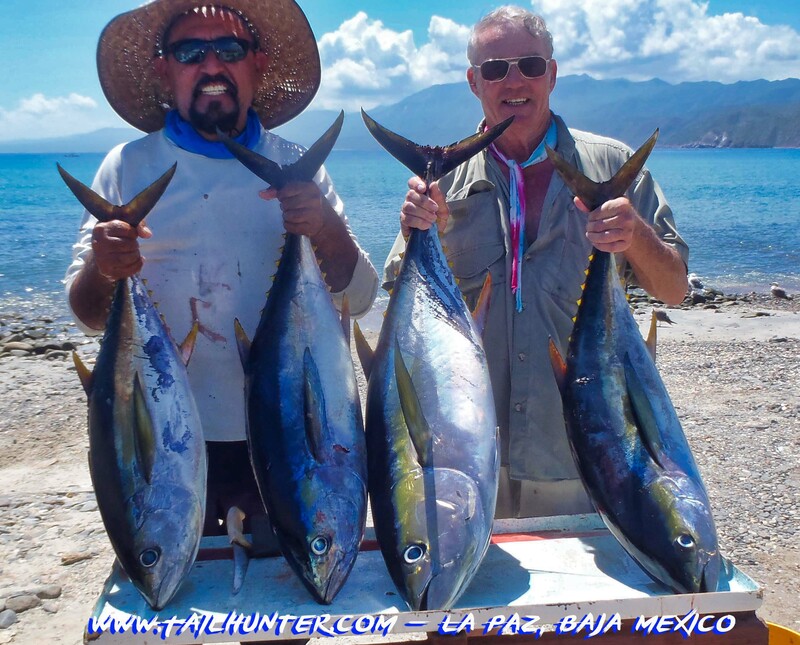 Scott Laughlin from San Diego and dad, Bob, from Arizona with Captain Armando posing with two 70-80 pound class tuna. 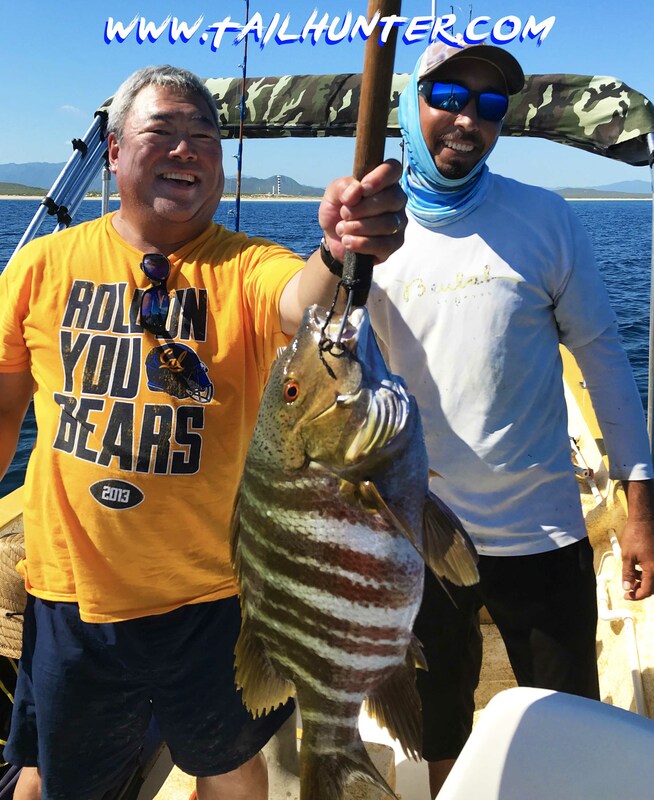 One was fought for 3 hours and snapped Bob’s new rod! 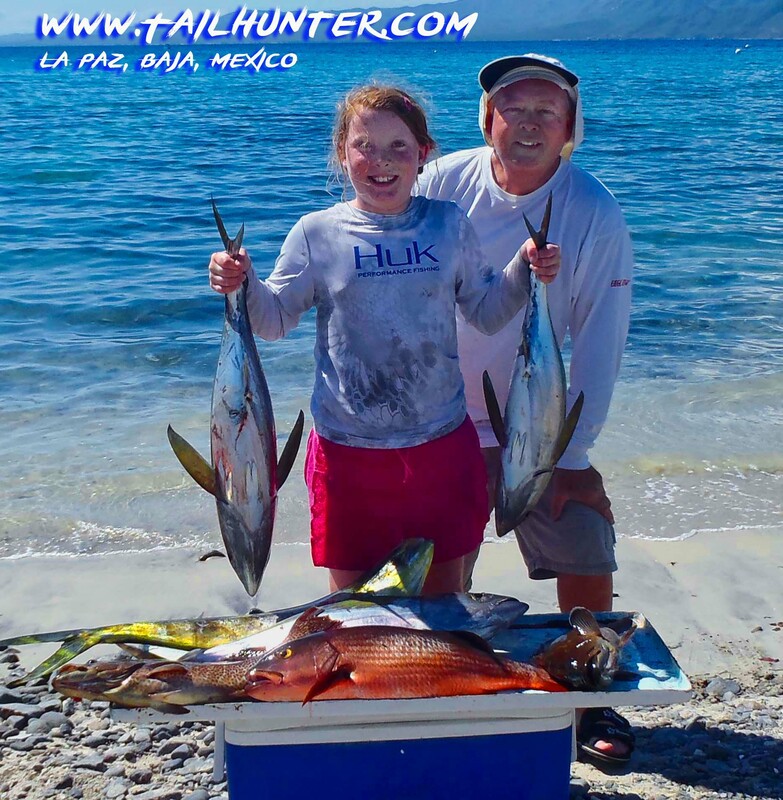 Adriana Beucler is just 8-years-old from Laguna Niguel CA and joined granddad, Wayne Meriwether for a day on the water and got quite a variety including her two tuna, dorado, pargo and cabrilla that ended up at a delicious dinner that night, according to Grandpa Wayne! 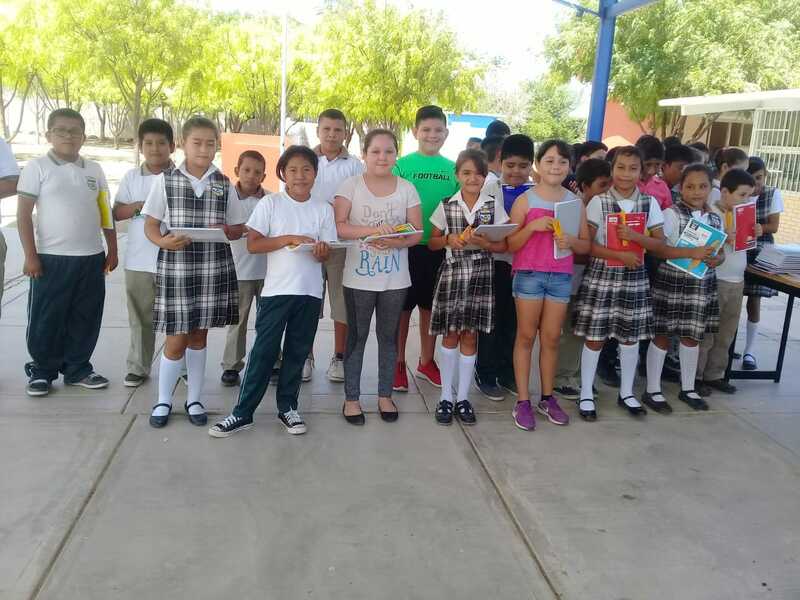 Good job, Adriana! Come visit us again! 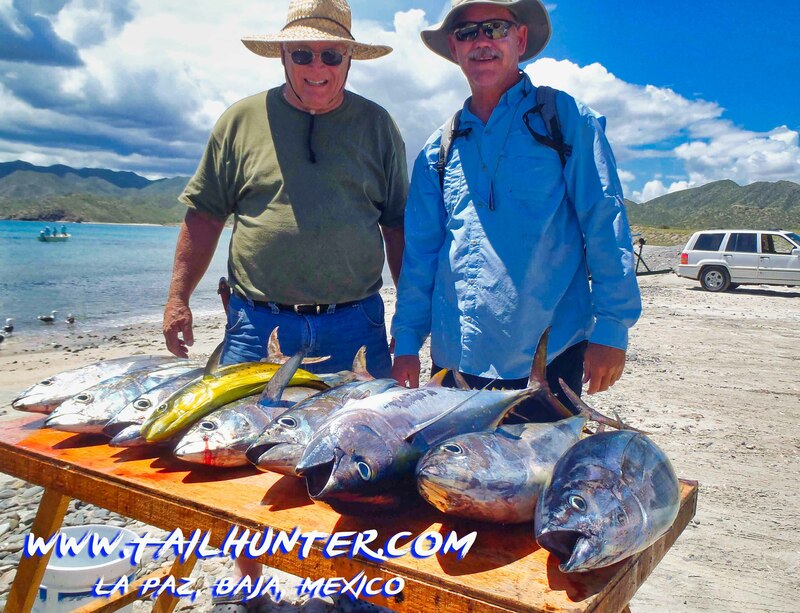 Captain Pancho looks on with our friends, Mac Treasure and Paul Jordan and a nice start to 3 days of fishing. 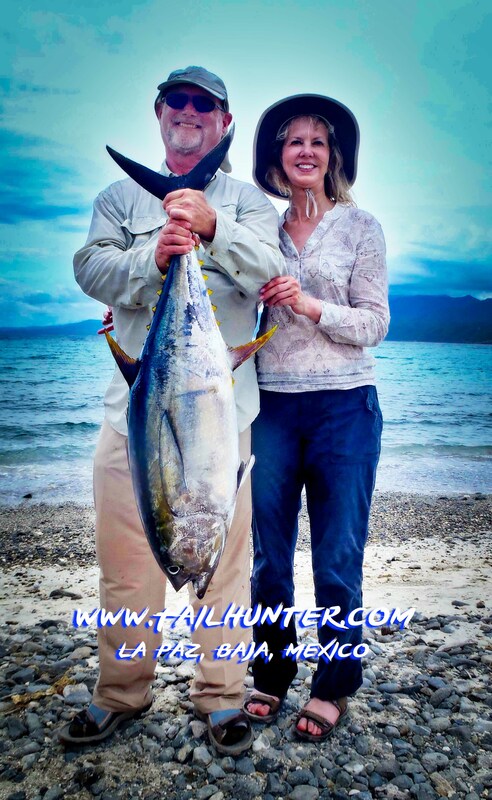 Fun folks from Redmond, Oregon, Ryan and Kelsey Williams pose with a couple of their yellowfin tuna. The man of bronze! 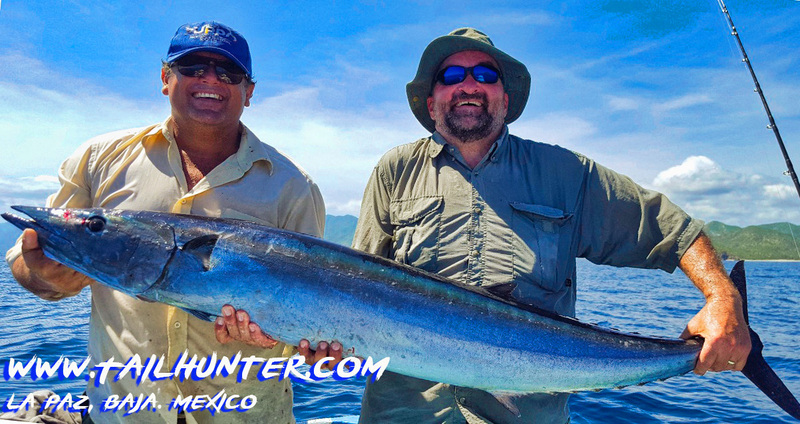 Scott Herman with another dorado caught with our Tailhuter La Paz fleet north of the city near Espirito Santo Island. 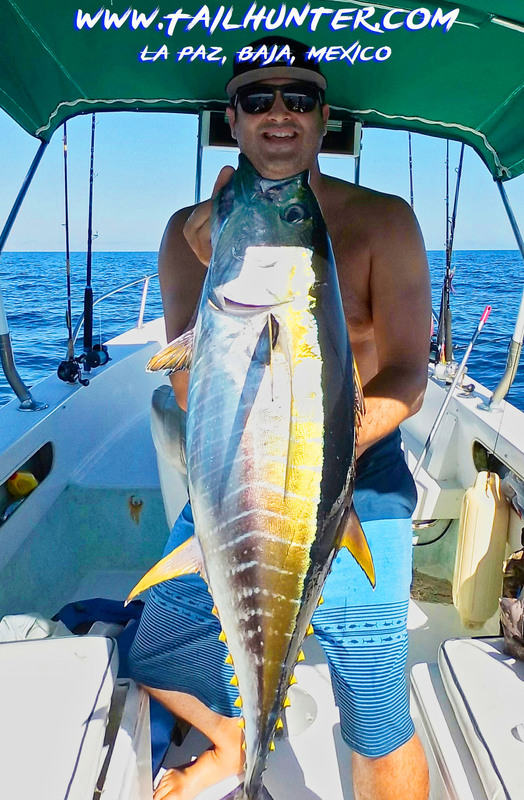 Great photo of Garrett Admiak and his 56-pound rocket tuna! It was Garrett’s first time fishing with us. 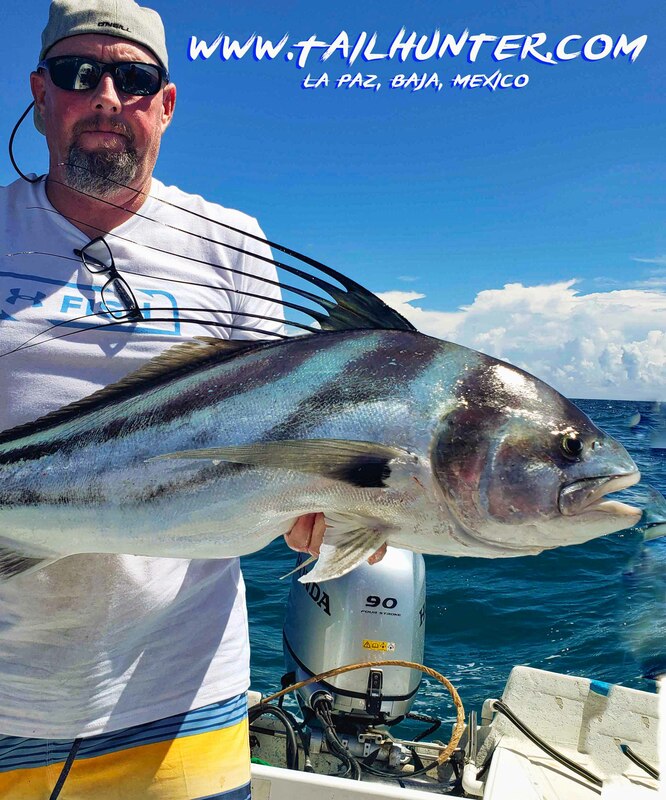 From Pennslyvania, Jeff Stahlman was able to pick up his first roosterfish. 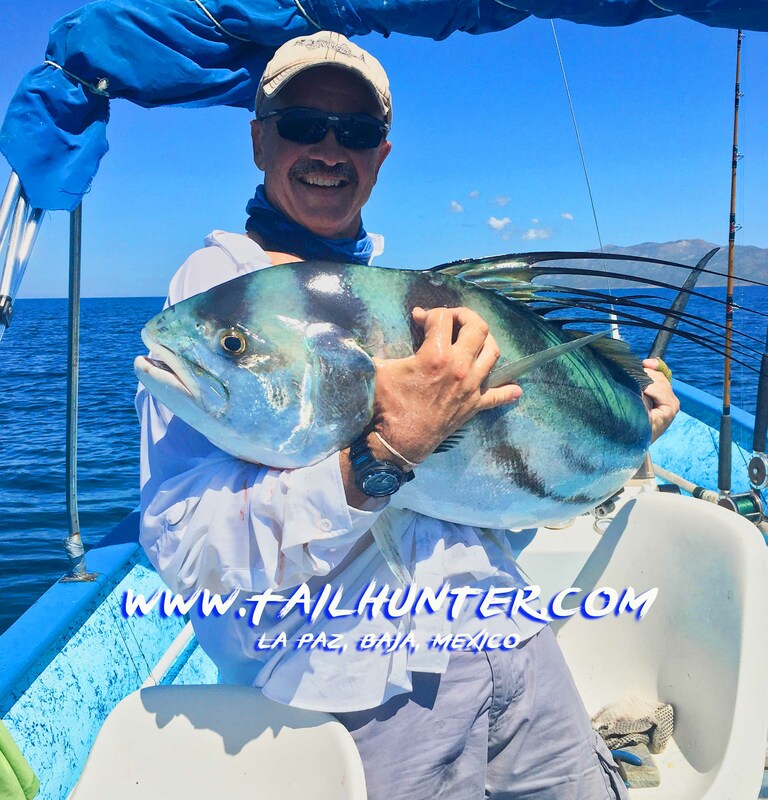 Caught and released! 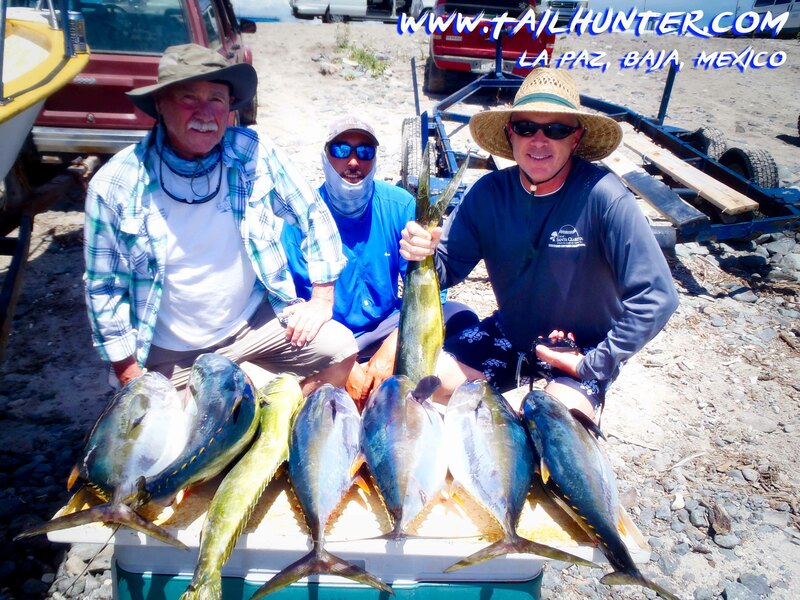 The man in the cool sunglasses, Lolo Bencomo with a double fist of tuna for the cooler. 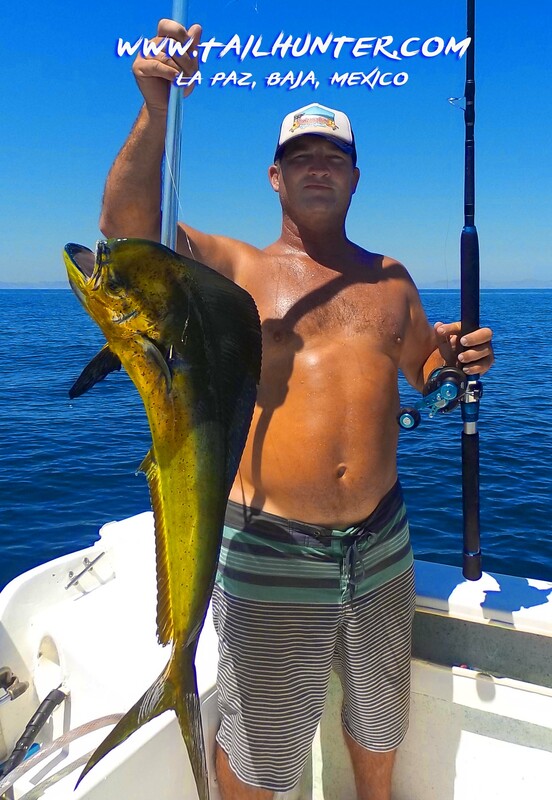 John Paladino had a big one on that got unbuttoned his first day, but came back on day 2 with this 40-pound class, yellowfin. With the clouds, it almost looks a bit like Alaska, but it’s Muertos Bay and Dave Sealy and Debbie Omstead are actually from Alaska! 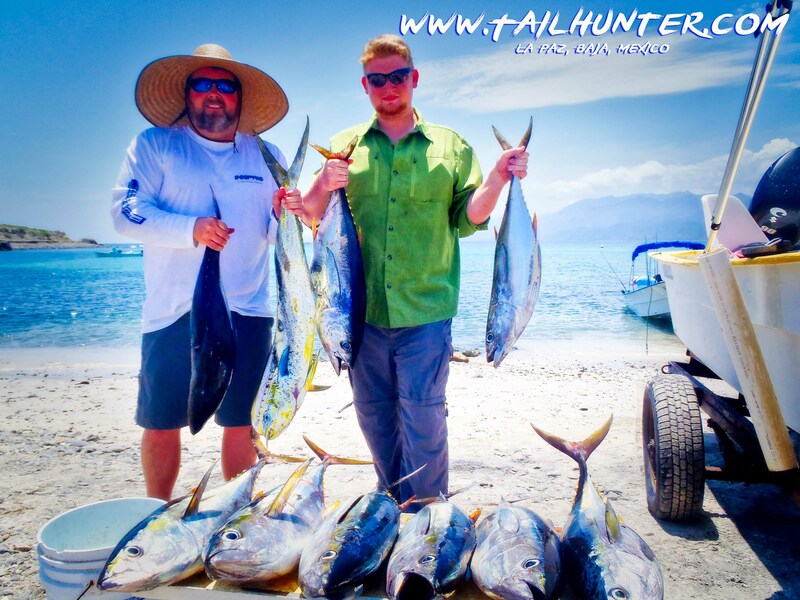 Nice tuna to add to their cooler of fish! 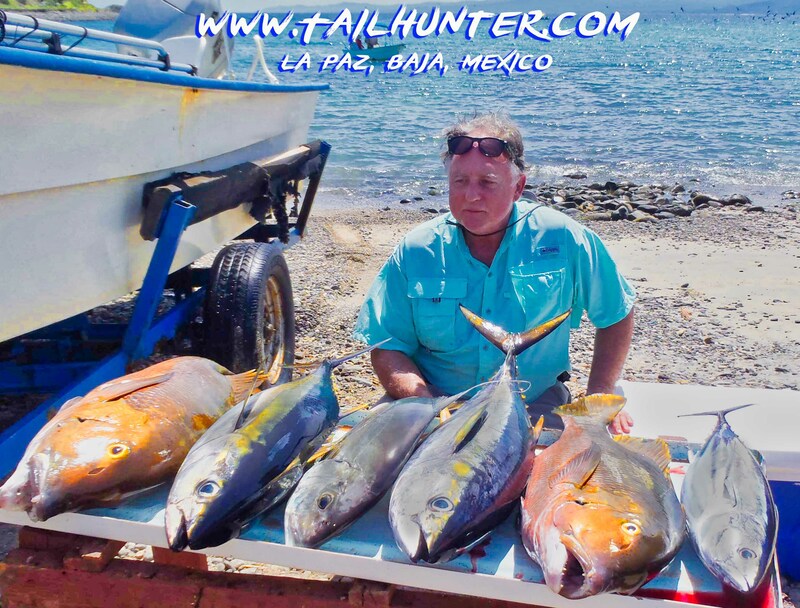 Jamie Moore, one of our visiting firefighters poses with a nice day’s catch of mixed tuna and dorado from Bahia Muertos. 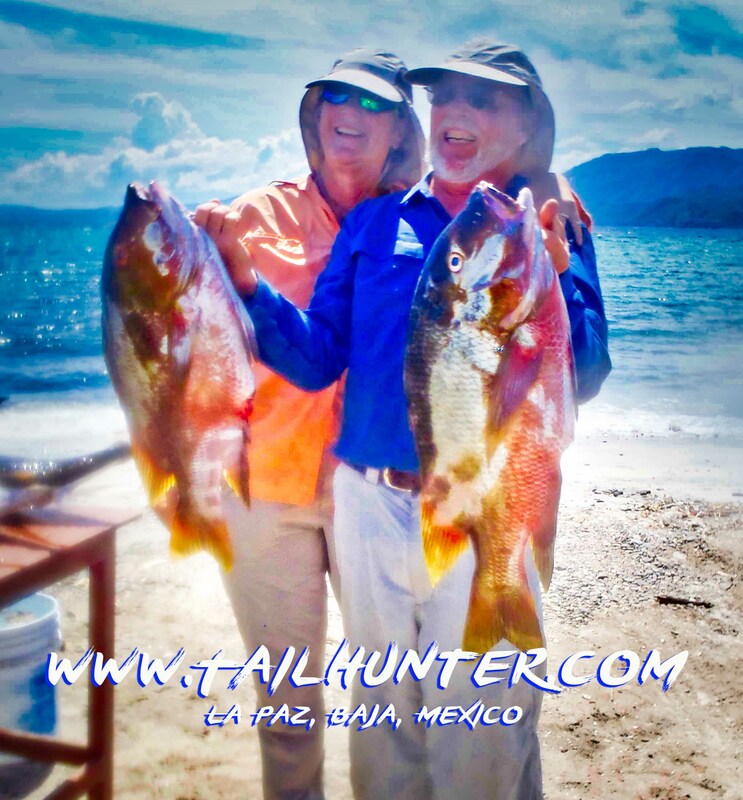 Great eating fish! 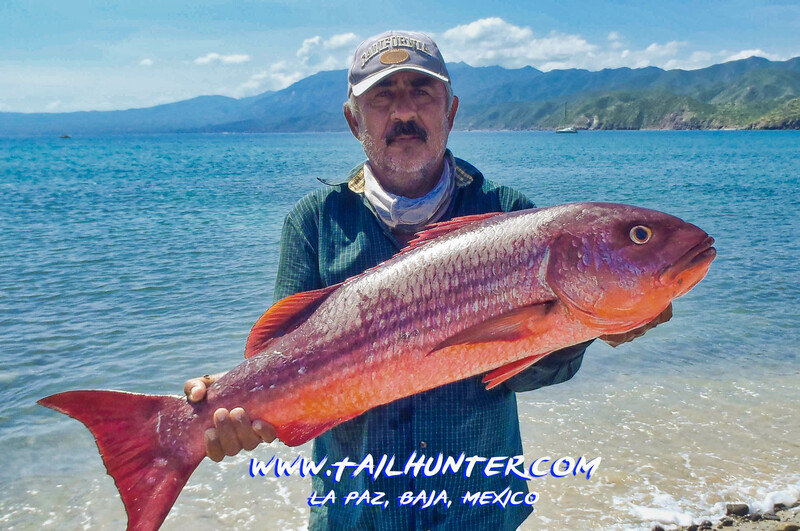 We’re seeing more pargo lately than normal. Tough fighters, but delicious eating. Note the afternoon storm clouds in the distance. Not uncommon this time of year to get a tropical thundershower or two. On the iron! 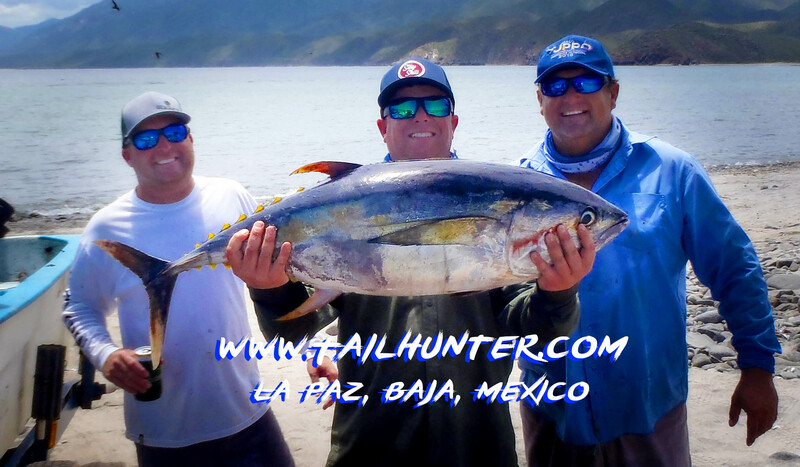 Ari Caldavilla from Redondo Beach CA dropped a jig and got inhalded by this hefty yellowfin with our Tailhunter La Paz fleet where we don’t usually see the kind of tuna action we’re getting this year! 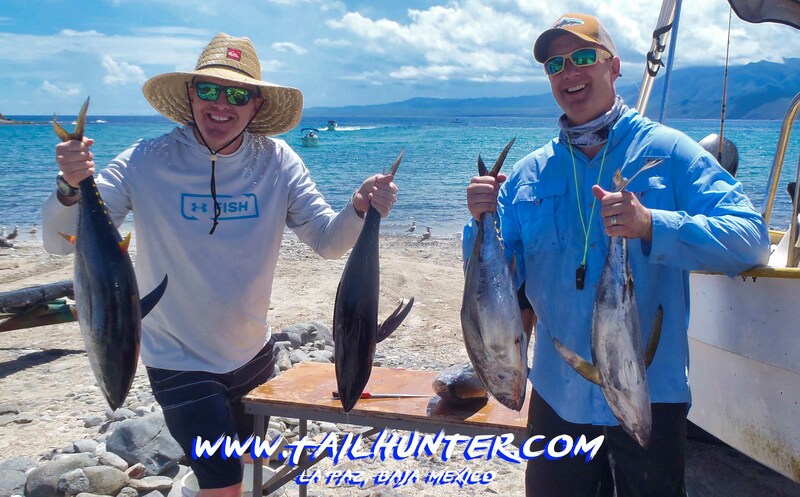 Greg West and Rich Pashley stacked ’em up on the beach. Somehow snuck a lone dorado into the pile! 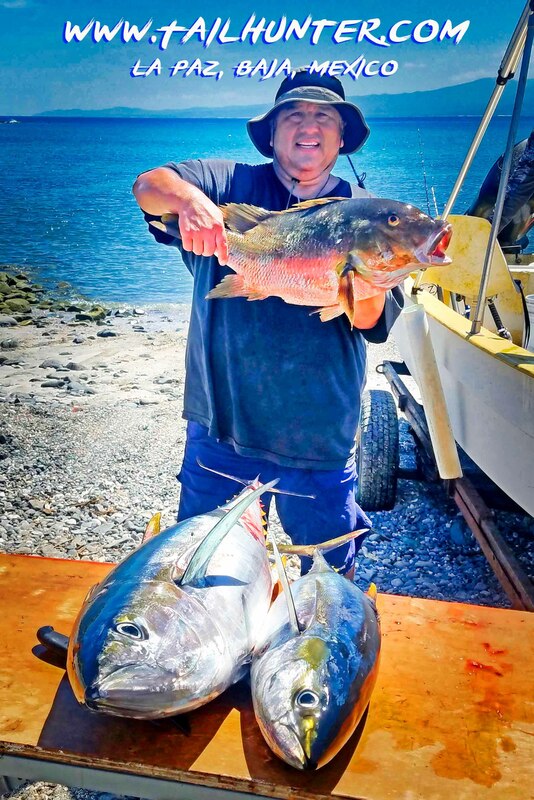 Paul Nagata from San Francisco and Captain Pancho are all smiles with this hefty barred pargo! 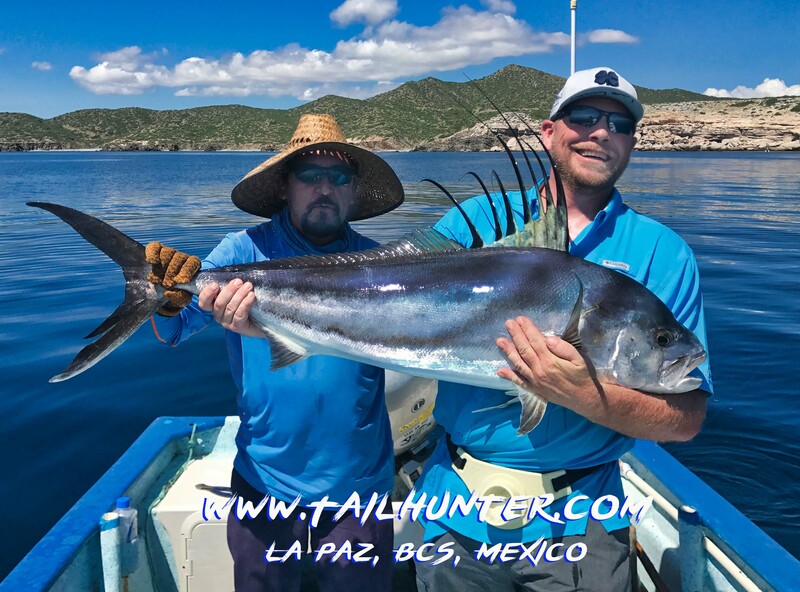 It was pretty solid fishing again this past week and tuna left no doubt that they’re going to hog center stage right now. 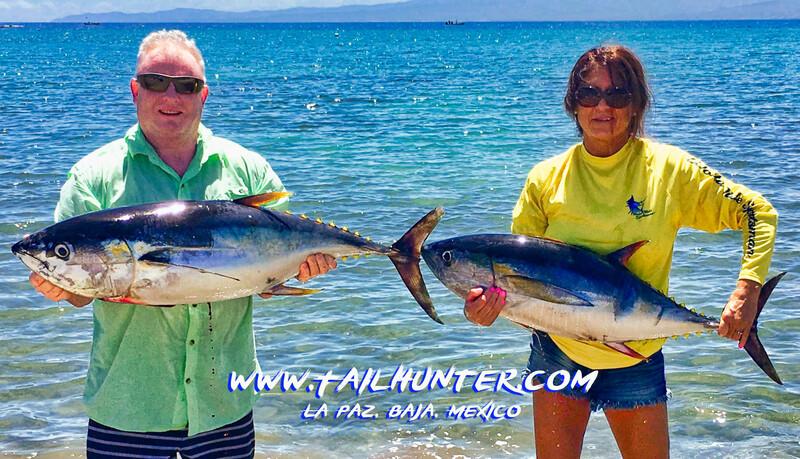 With our Tailhunter Las Arenas fleet the tuna bite continued to charge with fish ranging from a small as 10 pounders up to over 100 pounds. 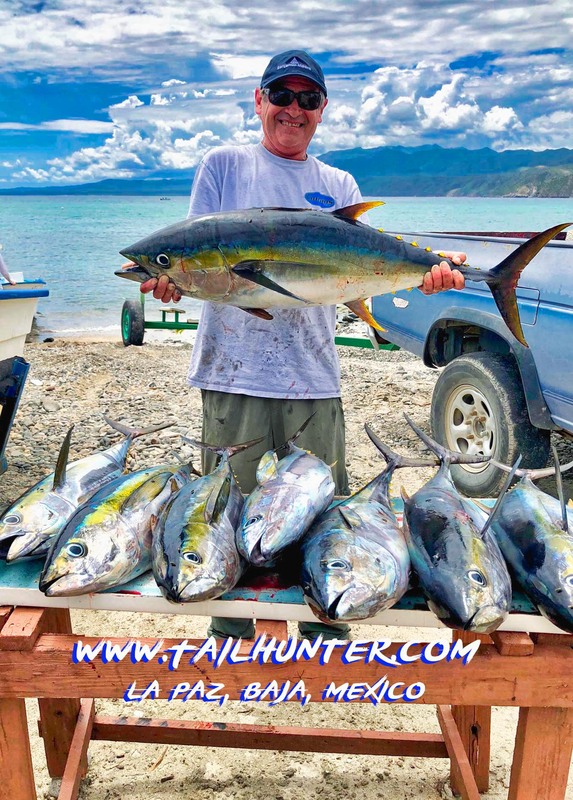 It’s like the tuna never left from last year and we’re just gonna keep riding that horse because these are fun fish…until you tie into one of the gorillas and spend 1, 2 or more hours bent on one of these hog fish. 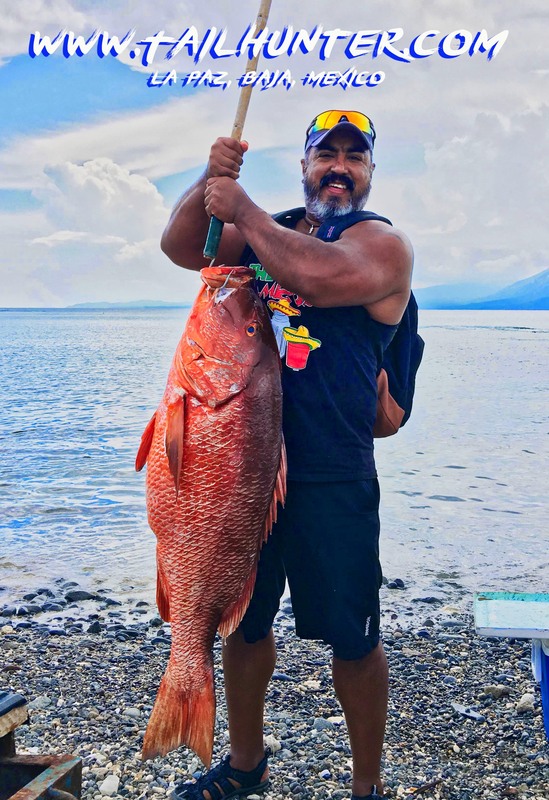 The thing is, most of this is on lighter tackle of 30-40 pounds. 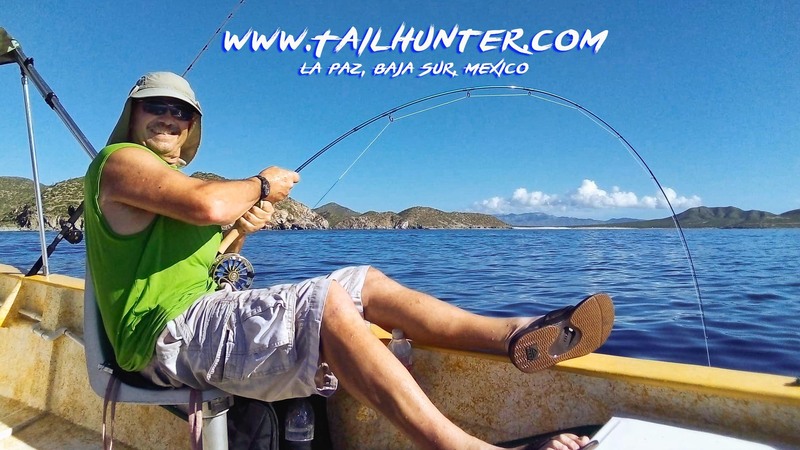 You just never know when the next fish will crush you. In the middle of boiling footballs suddenly a volkswagen yellowfin gulps your little sardine and you’ve got no choice but to hang on. The problem is that if you’re using the heavier stuff…you won’t get bit at all! So, the fish already has an advantage on you! The fish are in several spots, but you can never tell. There’s a spot at the south end of Cerralvo Island, but they are as close as the drop-off near the Punta Arena lighthouse maybe only ¼ mile offshore. 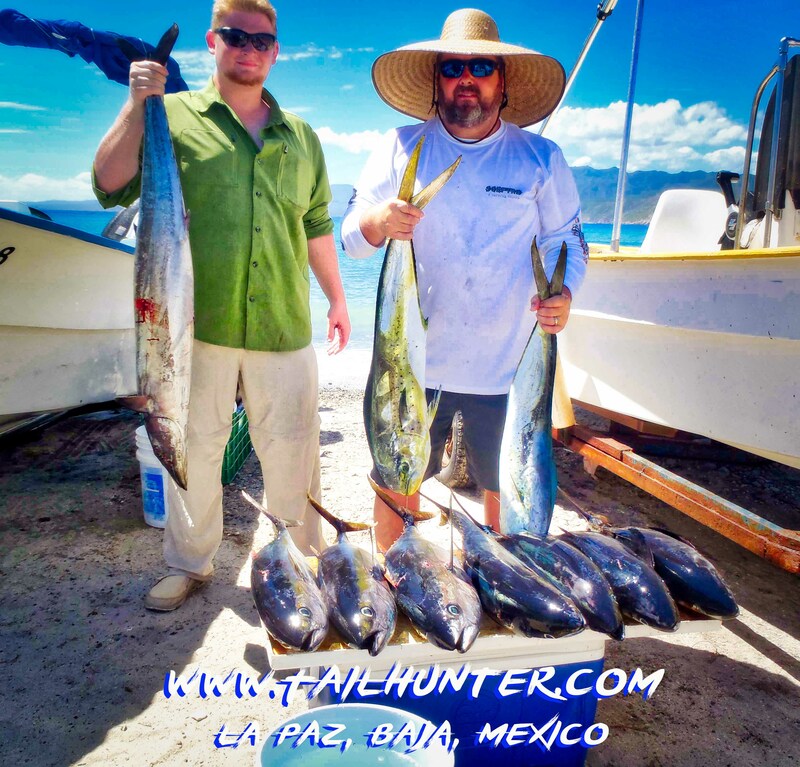 There’s also another spot maybe 100 yards from the beach near Punta Perrico and another close to shore spot just outside of Bahia Muertos before you hit Boca de Alamo. 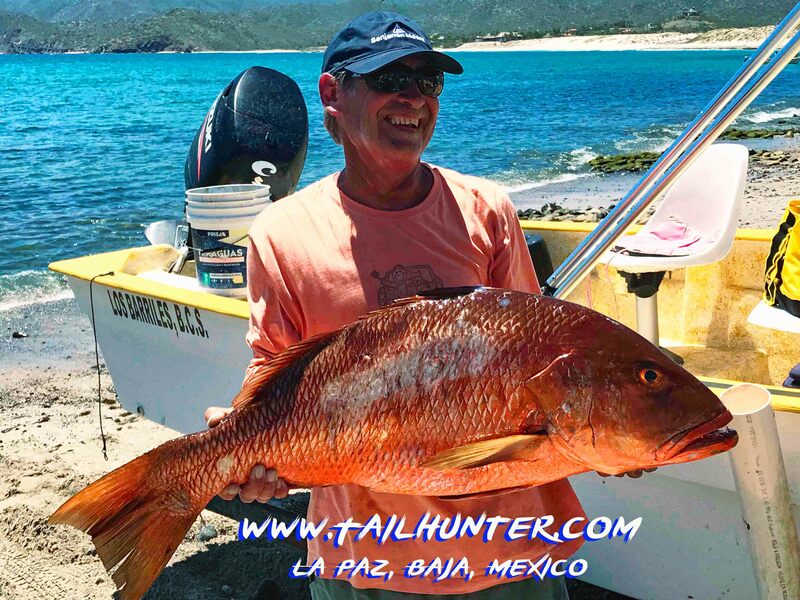 Imagine 50-100 pound fish that close to shore where sometimes you can see the bottom! 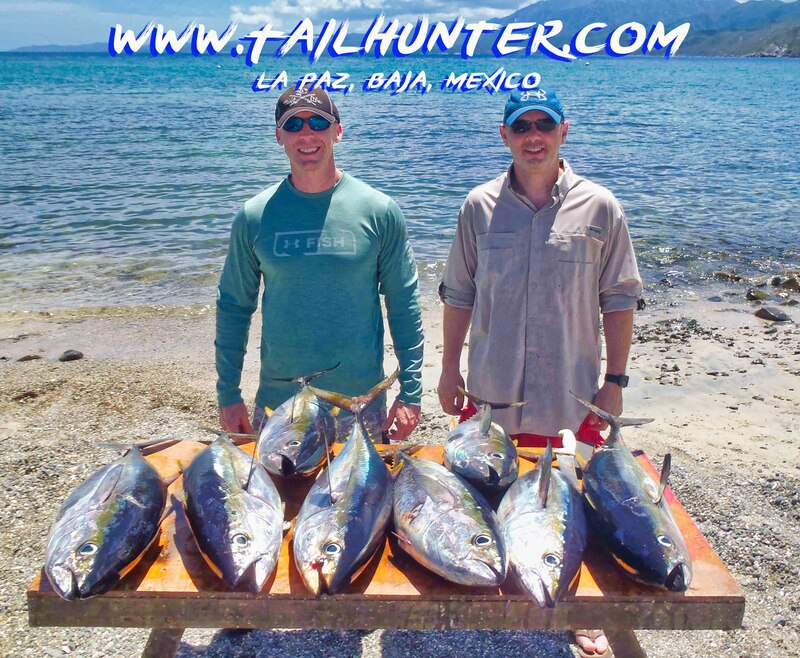 The biggest surprise is the tuna showing up en masse for our Tailhunter La Paz fleet. 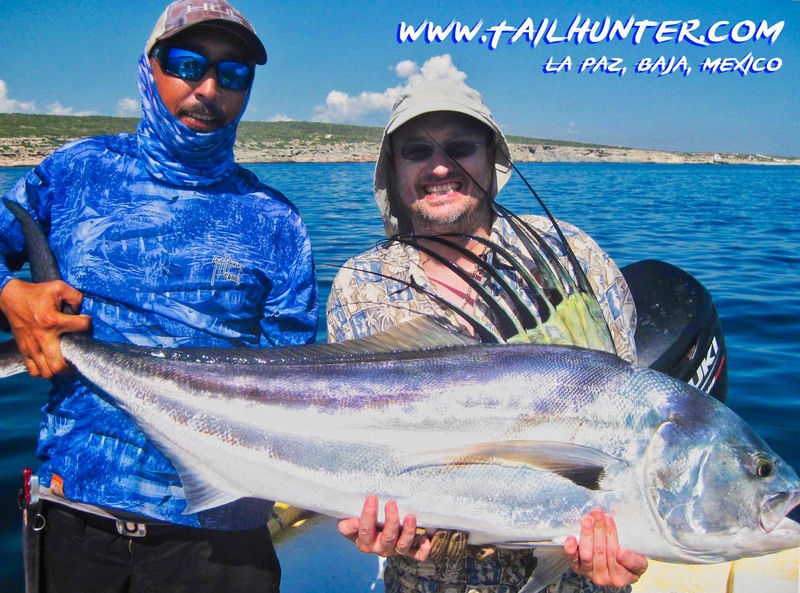 Usually for the La Paz fleets, the dorado are the main characters. 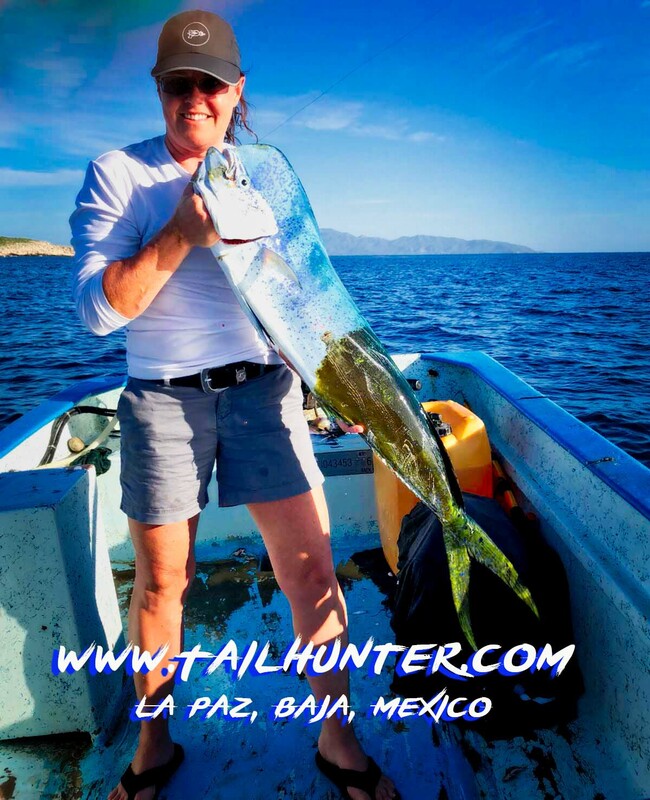 Probably 90% of the catch is dorado. 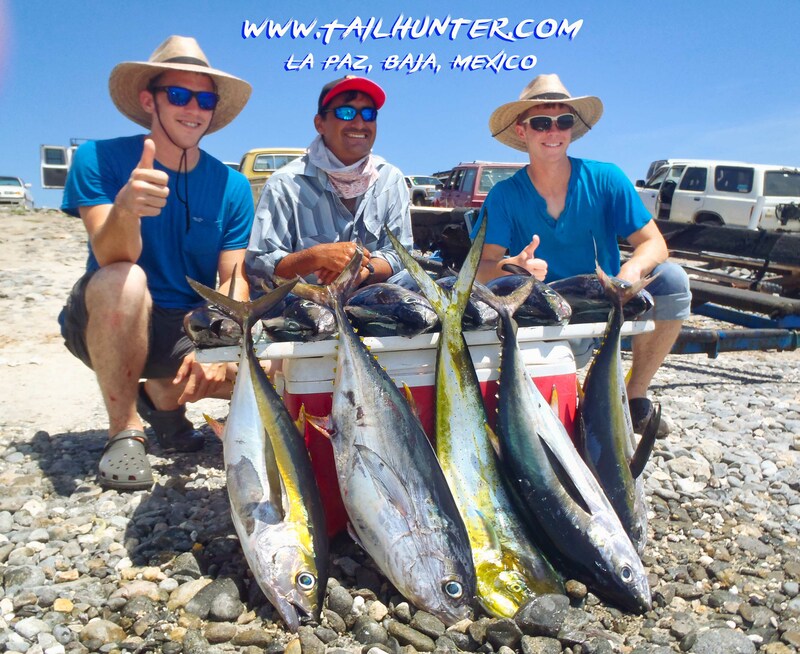 However, over the past few weeks tuna have been occasionally showing up in the middle of the dorado. 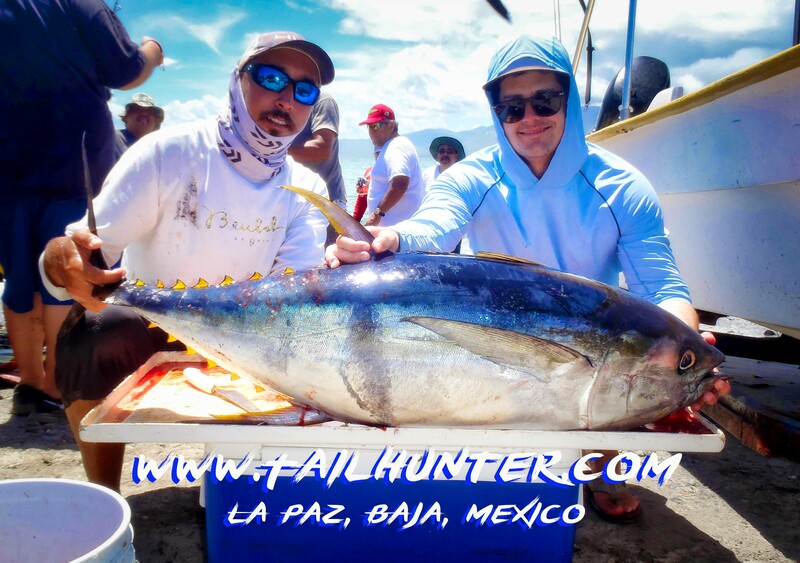 Well, this past week, the tuna came up boiling. 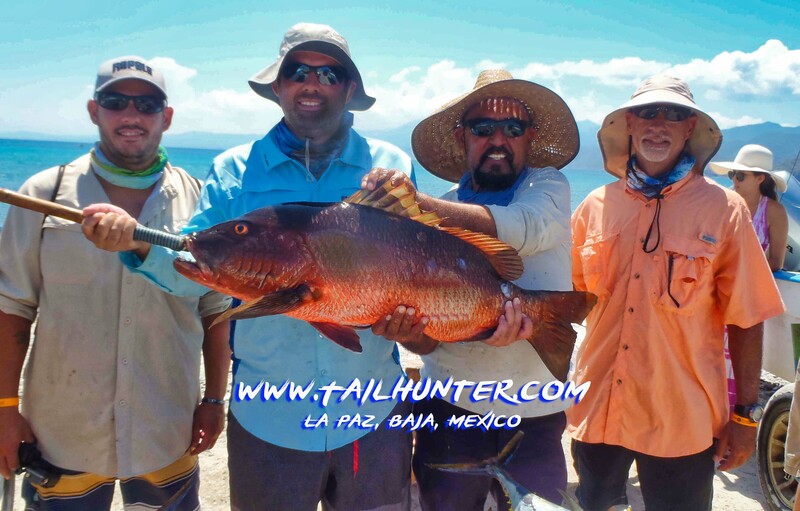 And these were healthy fun 20-30 pound class fish. Not footballs. 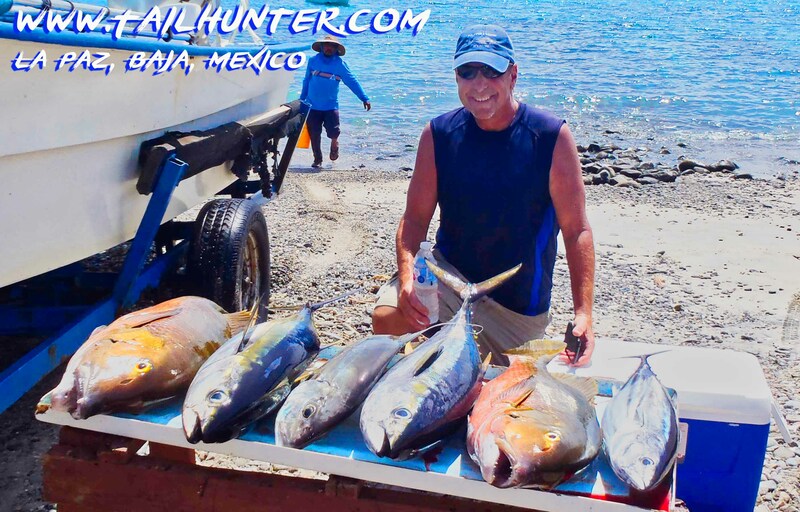 Also some larger 40 pounders ripping around as well plus we had several folks hooked on freight trains estimate at over 100 pounds! 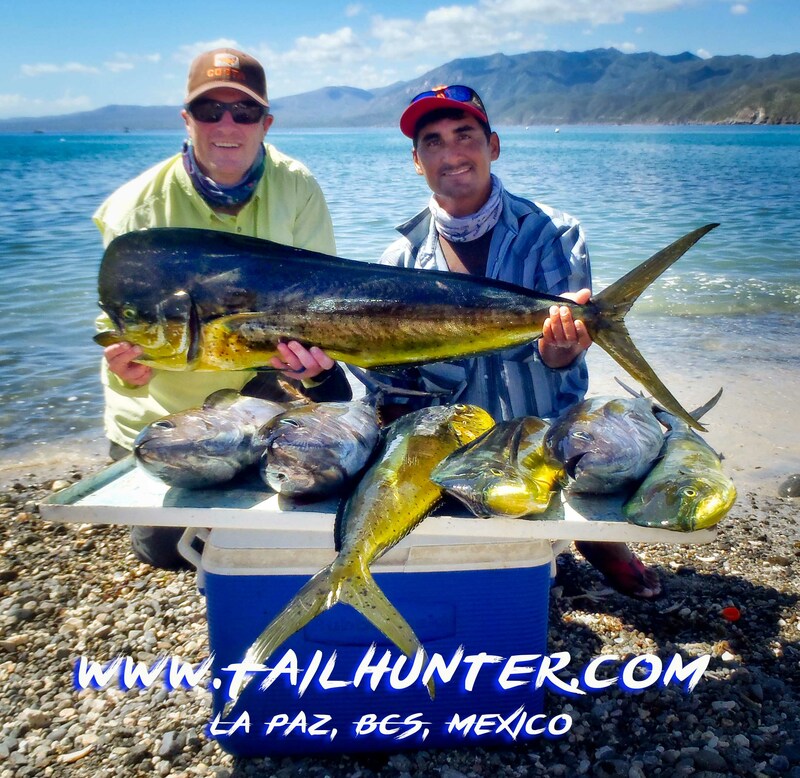 But, yes, there’s still dorado around. 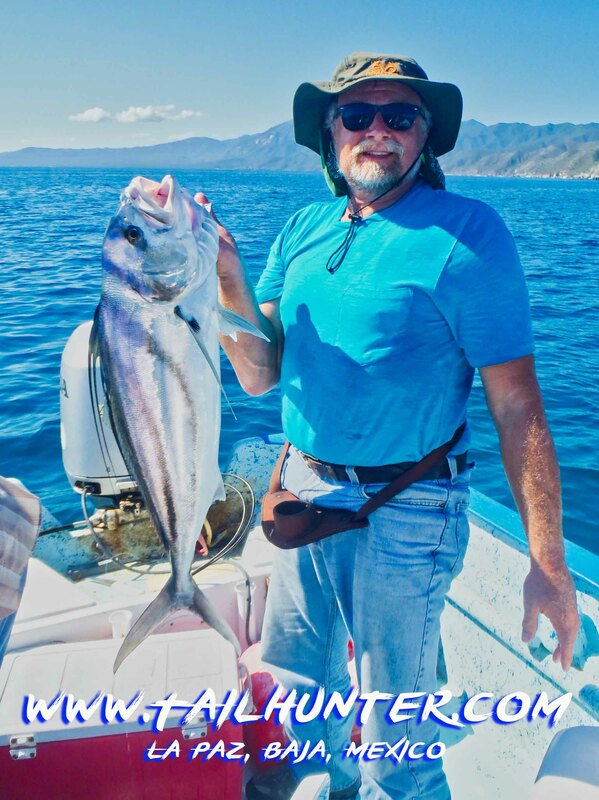 Plus roosterfish up to 70 pounds this past week. 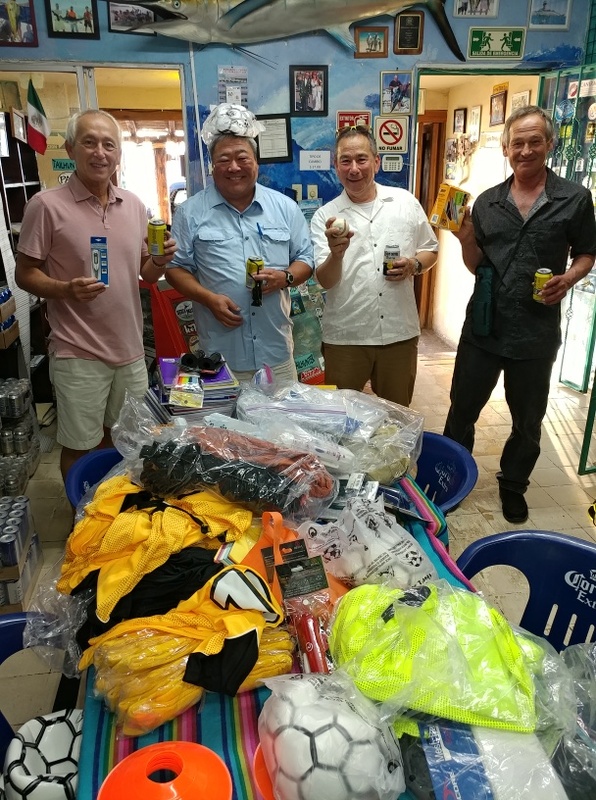 Add in some unusual big mullet snapper (pargo liso), some fat cabrilla (seabass) plus snapper and some other species and everyone had stuff to bring home in their ice chests. The weather was variable all week. Mostly hot and humid. One morning at 4:30 a.m. it was 94% humidity and like a heavy hot fog!!! Most days, rain is predicted, but it’s mostly in the afternooons after everyone is done and localized falling only here and there or enough to mess up your windshield. Then it’s gone. 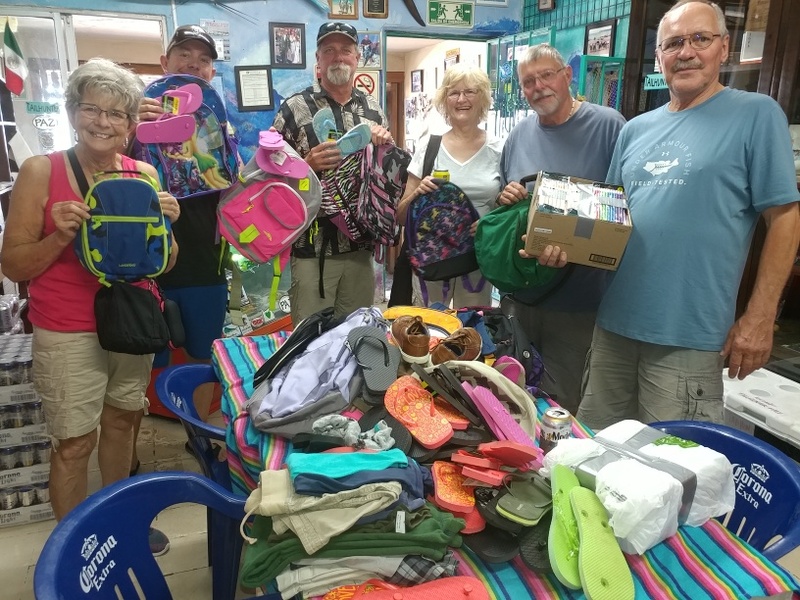 Want to shout out to everyone these past few weeks who have brought down stuff for our outreach program we’ve had now for 5 years that has produced several tons of donations around the city in an on-going year-long program. 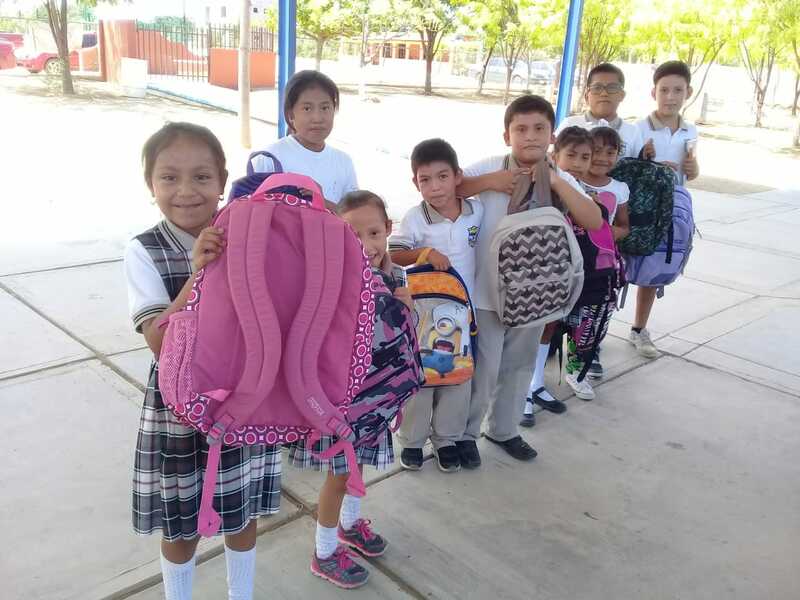 All from our Tailhunter Family and Friends finding a little space in their luggage and ice chest for everything from school supplies to shoes and toys to medical and hygiene items. 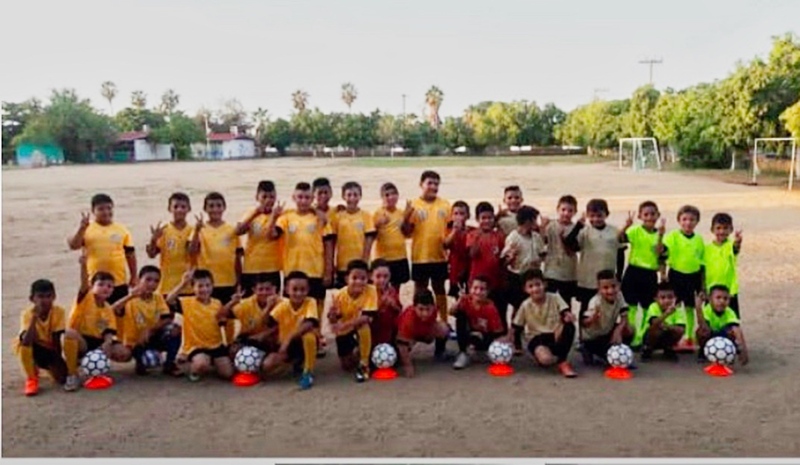 Regretfully I don’t have photos of everyone the past two weeks, but wanted to share some with you and the smiles they produced including one from a whole soccer team who were beneficiaries of an incredible donation of new uniforms and gear from Len Weaverling. Thank you all!